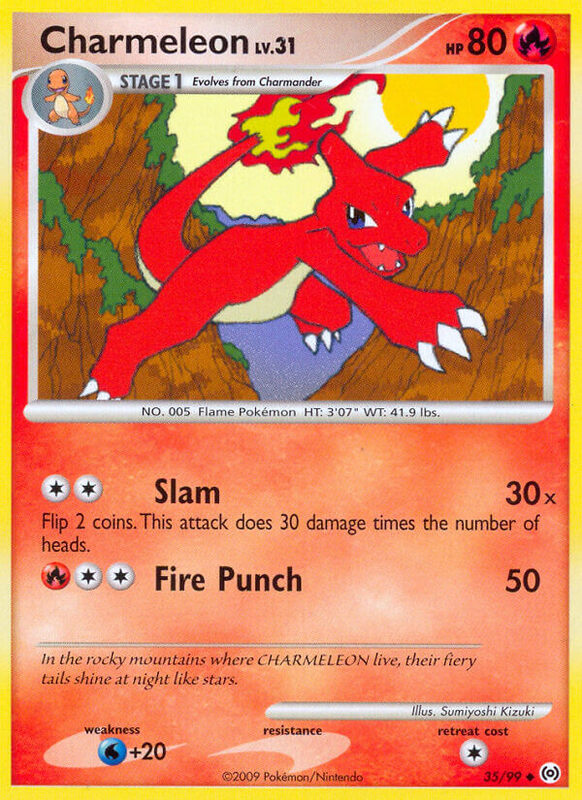 Each of Charizard’s attacks does 10 more damage for each [R] Pokémon on your Bench to your opponent’s Active Pokémon (before applying Weakness and Resistance). 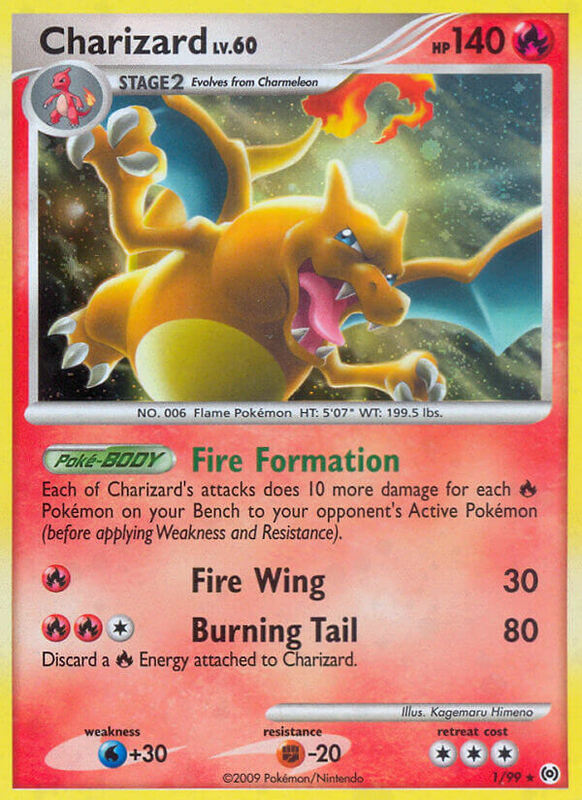 Discard a [R] Energy attached to Charizard. 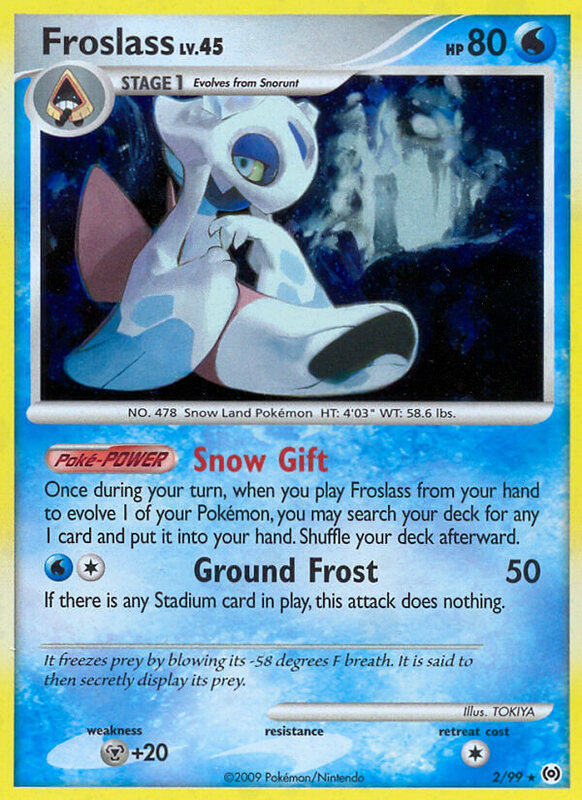 Once during your turn, when you play Froslass from your hand to evolve 1 of your Pokémon, you may search your deck for any 1 card and put it into your hand. Shuffle your deck afterward. If there is any Stadium Card in play, this attack does nothing. It freezes prey by blowing its -58 degrees F breath. It is said to then secretly display its prey. Discard the top 3 cards of your deck. This attack does 60 damage plus 20 more damage for each [R] or [M] Energy card you discarded. Its body is made of rugged steel. However, it is partially melted in spots because of its own heat. You may discard Helix Fossil, Dome Fossil, or Old Amber from your hand. If you do, this attack does 20 damage plus 50 more damage. 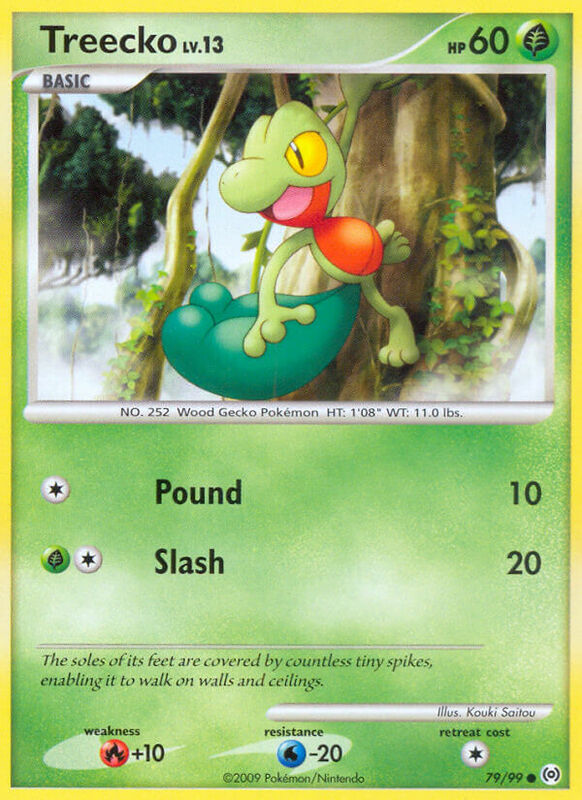 It is thought that this Pokémon came onto land because its prey adapted to life on land. 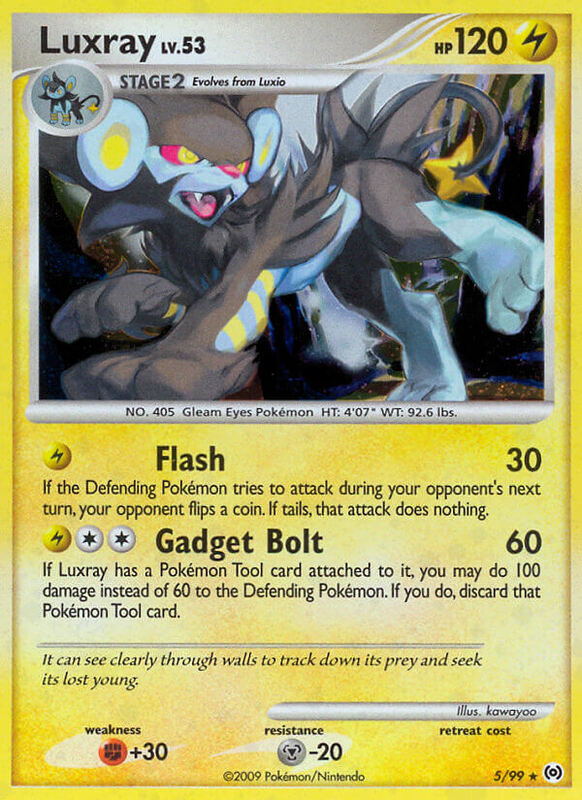 If Luxray has a Pokémon Tool card attached to it, you may do 100 damage instead of 60 to the Defending Pokémon. 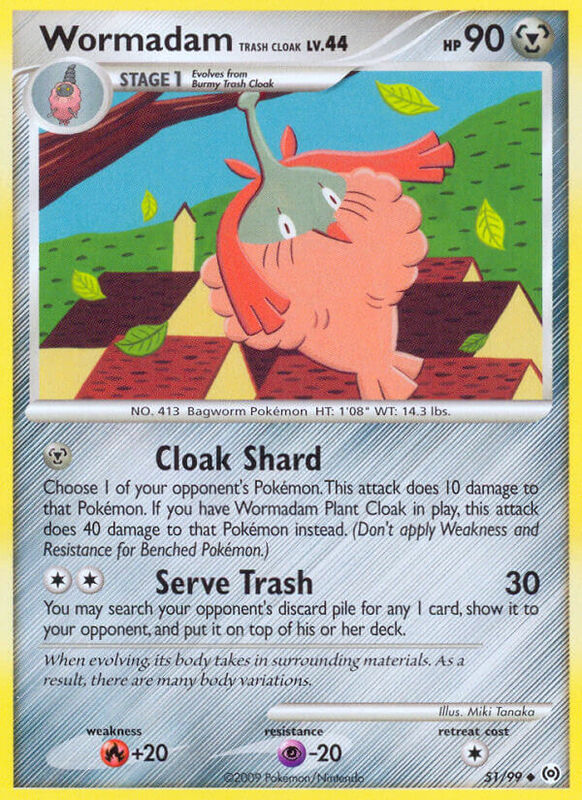 If you do, discard that Pokémon Tool card. Search your deck for up to 3 in any combination of Burmy and Wormadam, show them to your opponent, and put them into your hand. Shuffle your deck afterwards. 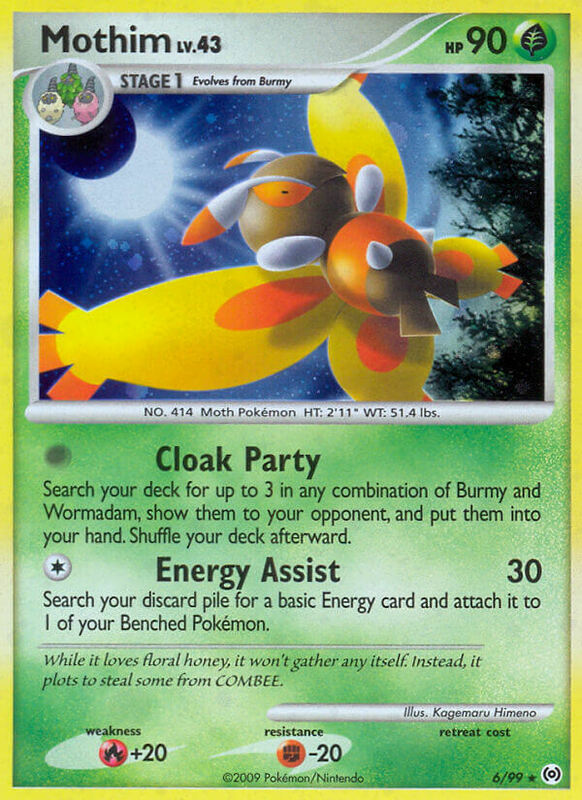 Seach your discard pile for a basic Energy card and attach it to 1 of your Benched Pokémon. While it loves floral honey, it won’t gather any itself. Instead, it plots to steal some from Combee. 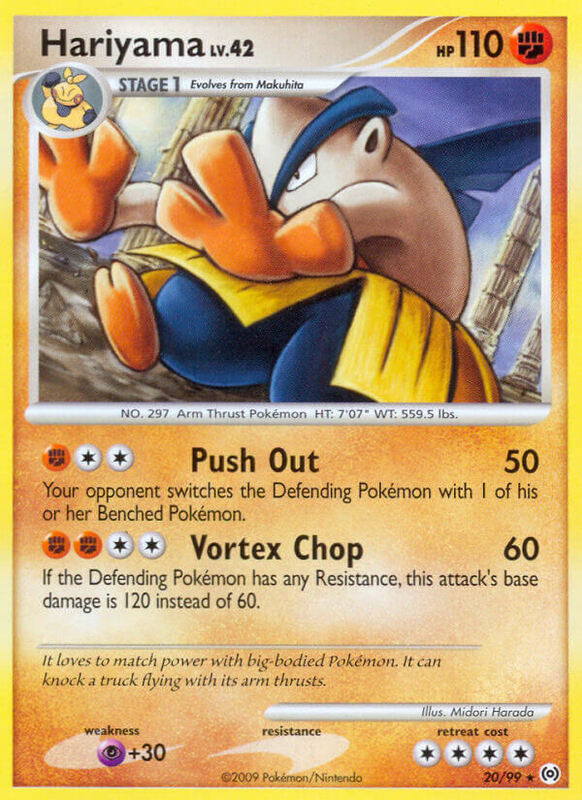 If you don’t have a Supporter card in play, each of Probopass’s attacks does 30 more damage to the Active Pokémon (before applying Weakness and Resistance). Flip a coin. If heads, this attack does 50 damage plus 20 more damage. Once during your turn (before your attack), you may reveal the top card of your deck. 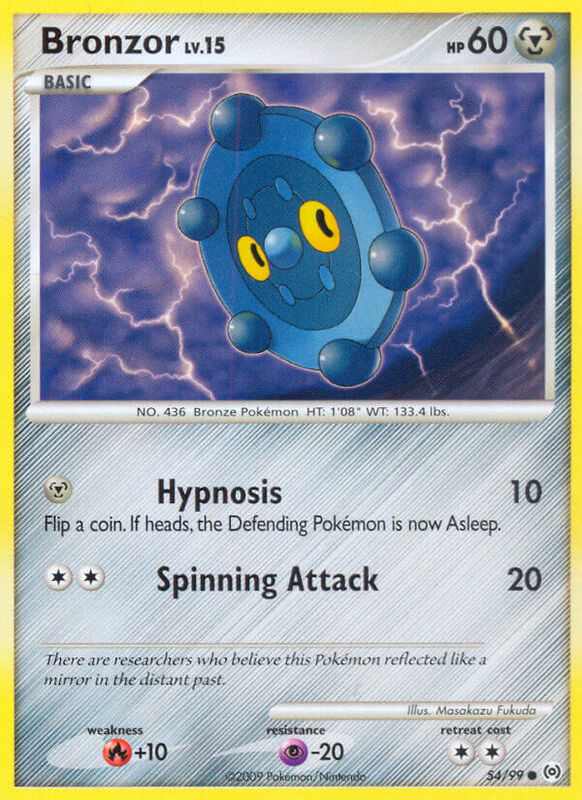 If that card is a basic Energy card, attach it to 1 of your Pokémon. If that card isn’t a basic Energy card, discard it. 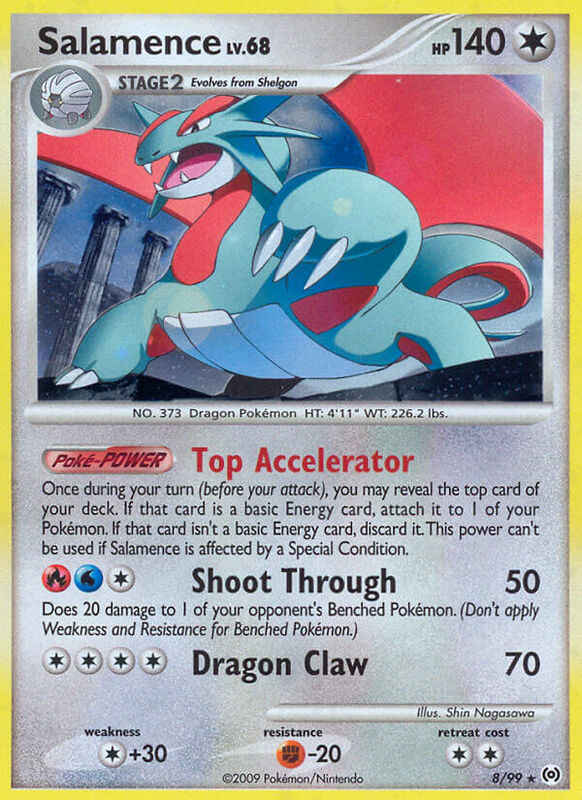 This power can’t be used if Salamence is affected by a Special Condition. You may do 50 damage plus 30 more damage. 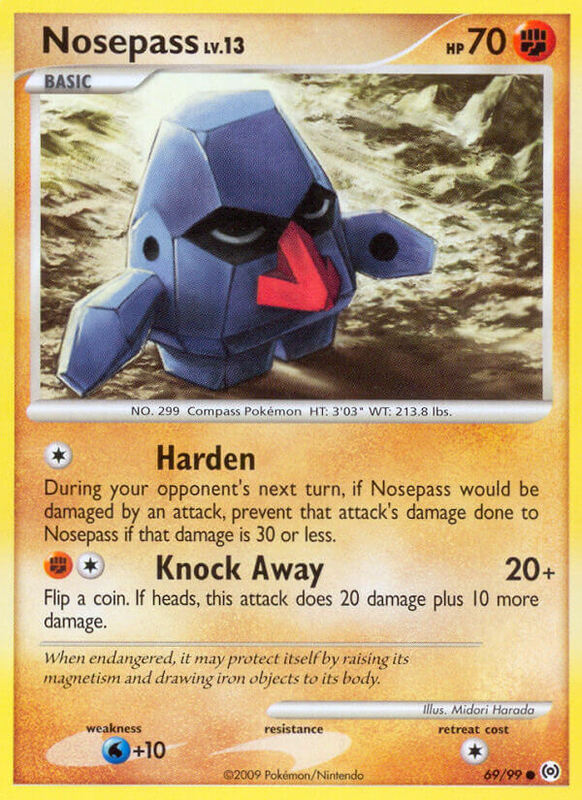 If you do, this attack does 30 damage to 1 of your Pokémon, and don’t apply Weakness and Resistance to this damage. It swallows anything whole. It sweats toxic fluids from its follicles to douse foes. During your opponent’s next turn, any damage done to Tangrowth by attacks is reduced by 20 (after applying Weakness and Resistance). Before doing damage, count the remaining HP of the Defending Pokémon and Tangrowth. If the Defending Pokémon has fewer remaining HP than Tangrowth’s, this attack does 120 damage instead. Its arms are made of plants that bind themselves to things. They grow back right away if cut. 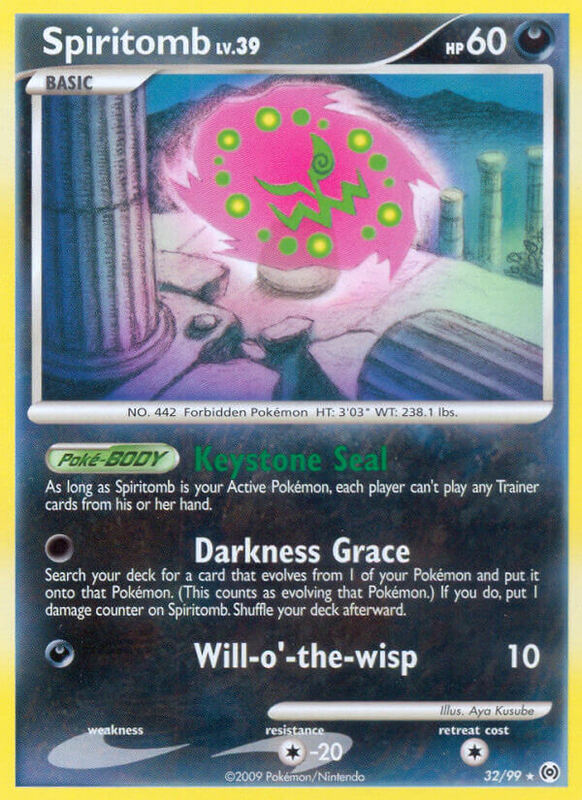 If Toxicroak has any [P] Energy attached to it, the Defending Pokémon is now Poisoned. 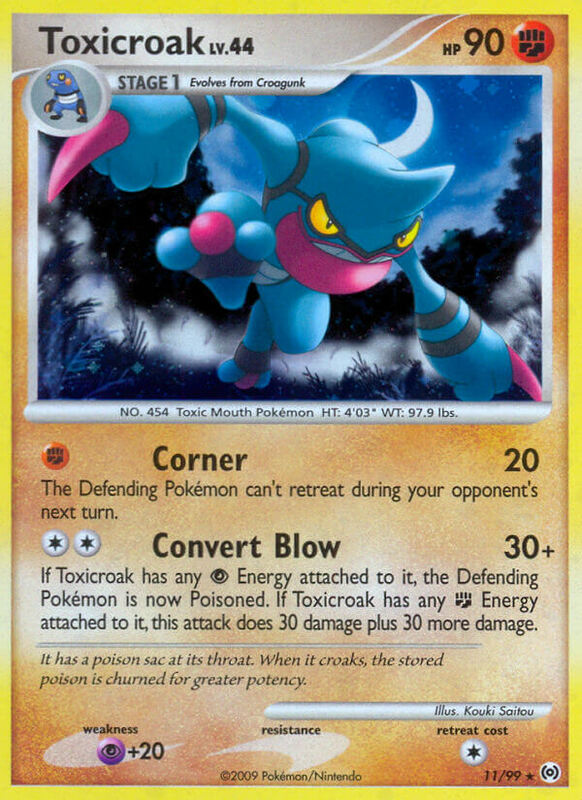 If Toxicroak has any [F] Energy attached to it, this attack does 30 damage plus 30 more damage. Flip a coin. 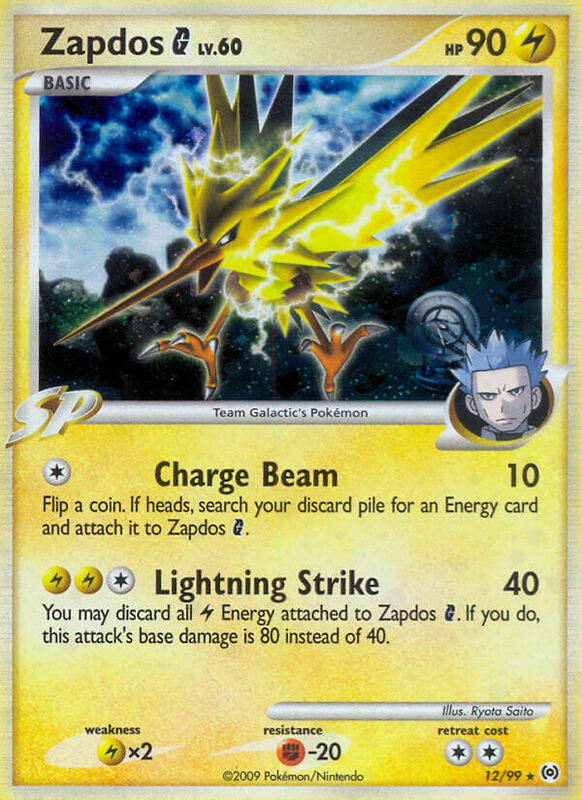 If heads, search your discard pile for an Energy card and attach it to Zapdos G.
You may discard all [L] attached to Zapdos G. If you do, this attack’s base damage is 80 instead of 40. 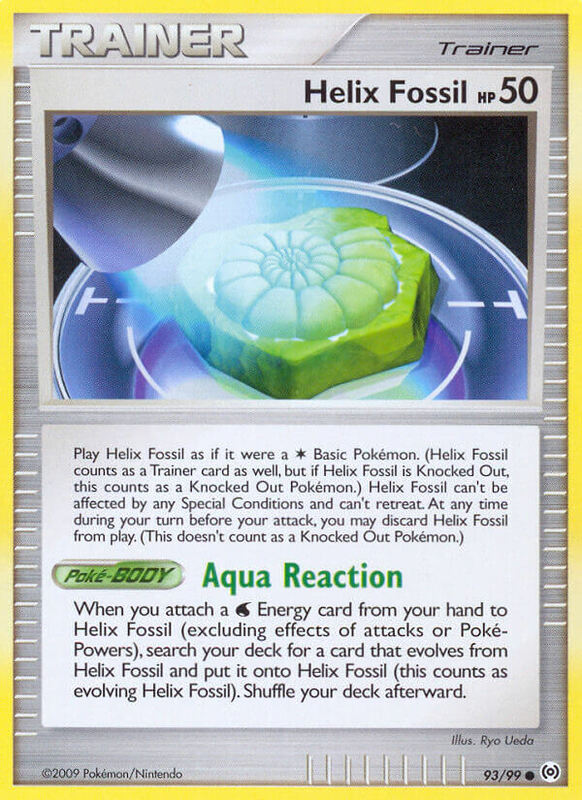 Once during your turn (before your attack), you may search your deck for Helix Fossil, Dome Fossil, or Old Amber, show it your opponent, and put it into your hand. Shuffle your deck afterward. 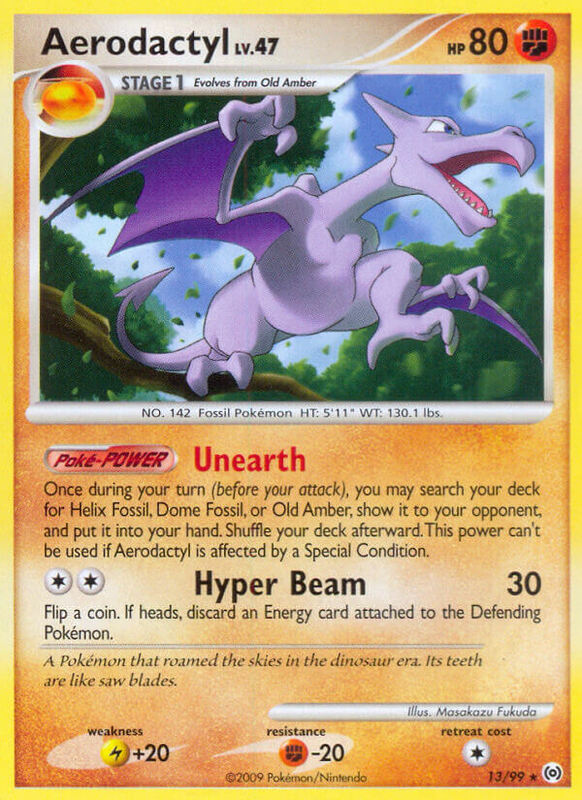 This power can’t be used if Aerodactyl is affected by a Special Condition. 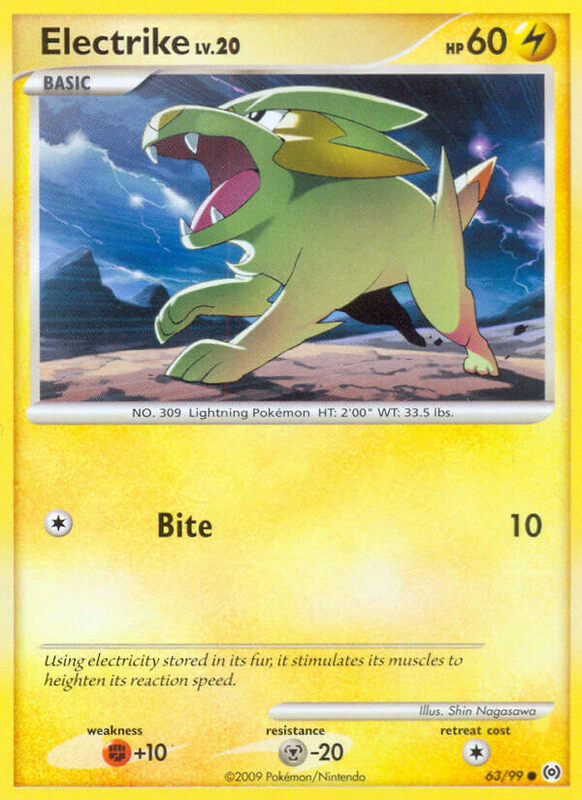 A Pokémon that roamed the skies in the dinosaur era. Its teeth are like saw blades. 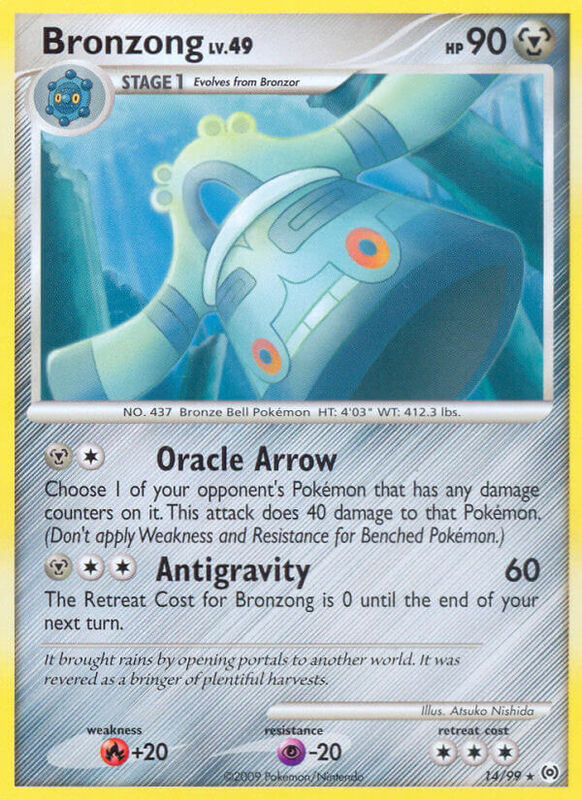 The Retreat Cost for Bronzong is 0 until the end of your next turn. It brought rains by opening portals to another world. It was revered as a bringer of plentiful harvests. 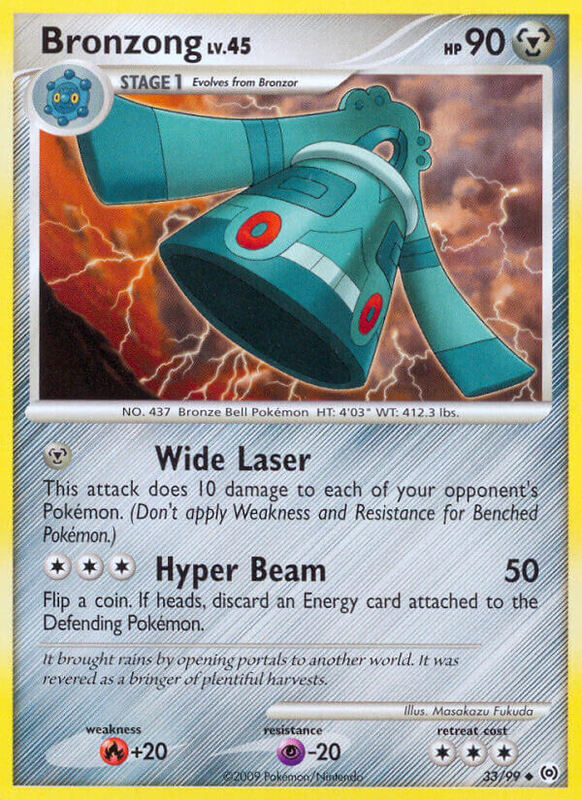 If any of your [G] Pokémon or [R] Pokémon would be damaged by an attack, reduce this damage by 10 (after applying Weakness and Resistance). If it senses strong sunlight, it opens its folded petals to absorb the sun’s rays with its whole body. 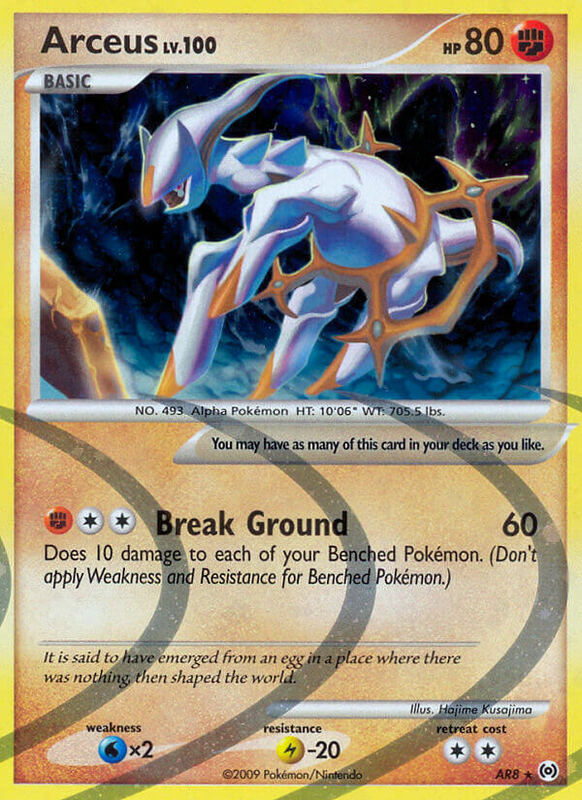 Once during your turn (before your attack), you may move 1 damage counter from 1 of your opponent’s Pokémon to another of your opponent’s Pokémon. 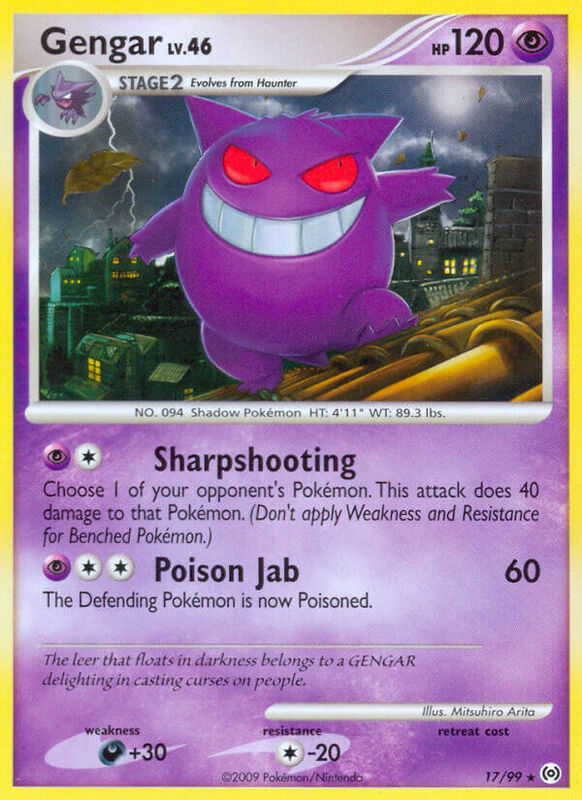 This power can’t be used if Gengar is affected by a Special Condition. 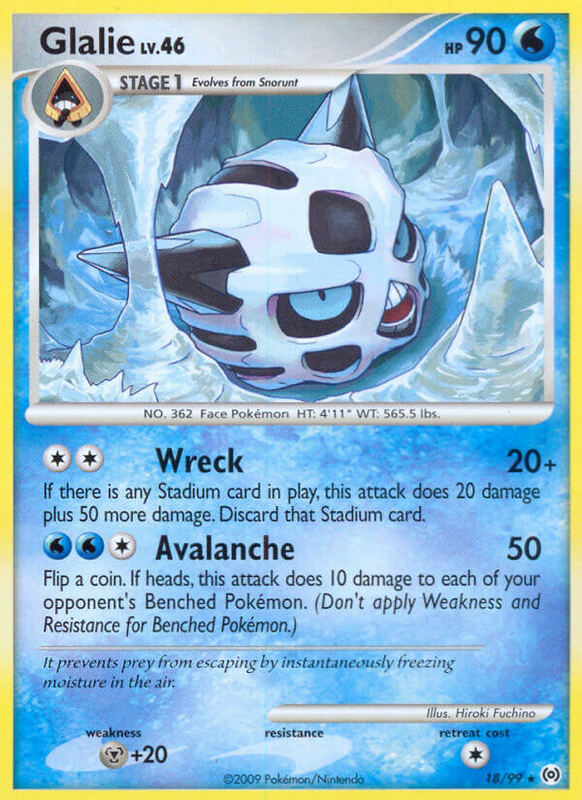 Does 10 damage to 1 of your opponent’s Benched Pokémon. (Don’t apply Weakness and Resistance for Benched Pokémon.) You may switch Gengar with 1 of your Benched Pokémon. The leer that floats in darkness belongs to a Gengar delighting in casting curses on people. If there is any Stadium card in play, this attack does 20 damage plus 50 more damage. Discard that Stadium card. It prevents prey from escaping by instantaneously freezing moisture in the air. Discard as many [F] Energy cards as you like from your hand. 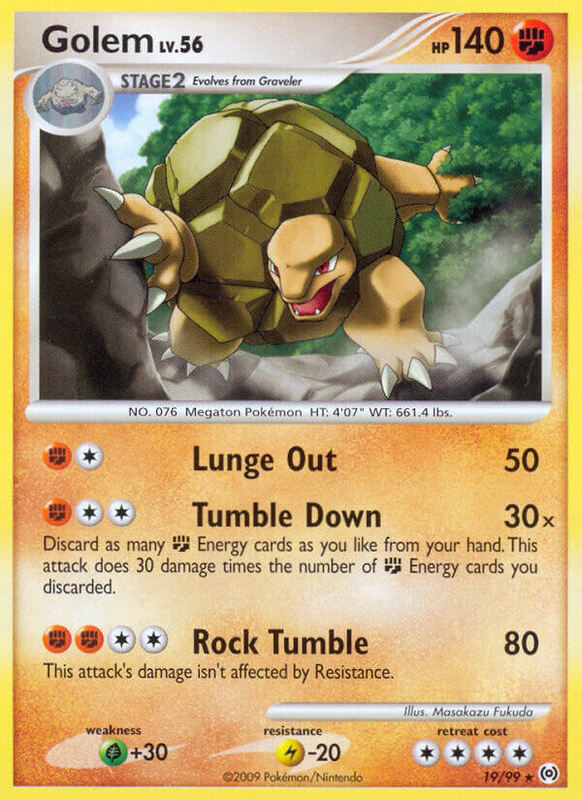 The attack does 30 damage times the number of [F] Energy cards you discarded. If the Defending Pokémon has any Resistance, this attack’s base damage is 120 instead of 60. 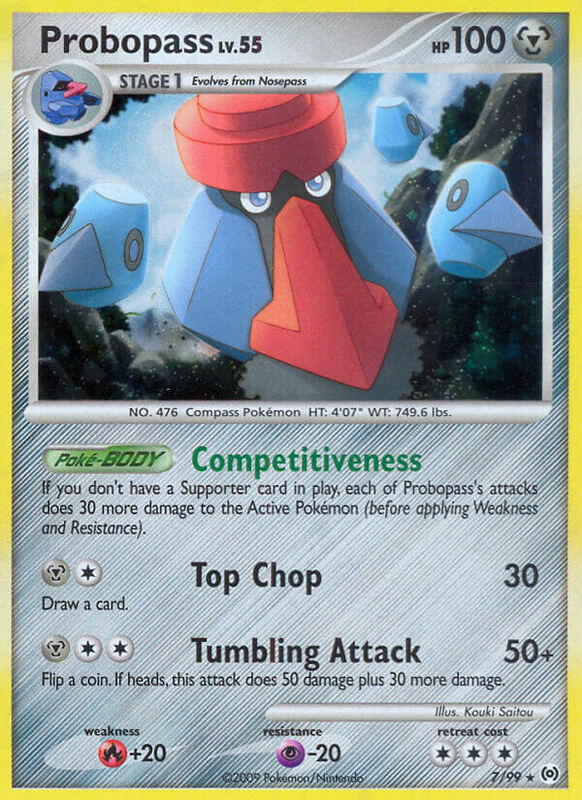 It loves to match power with big-bodied Pokémon. It can knock a truck flying with its arm thrusts. 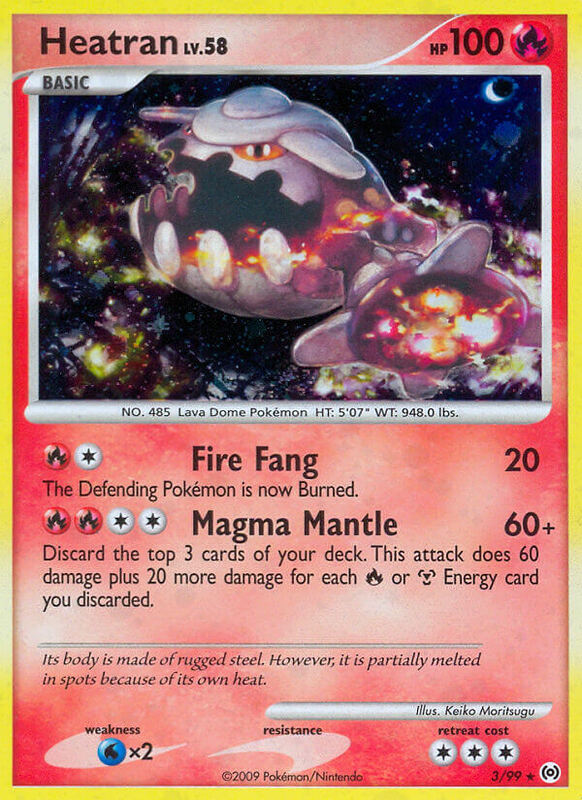 Once during your turn (before your attack), you may discard an Energy card from your hand. If you do, remove 1 damage counter from each of your Pokémon. 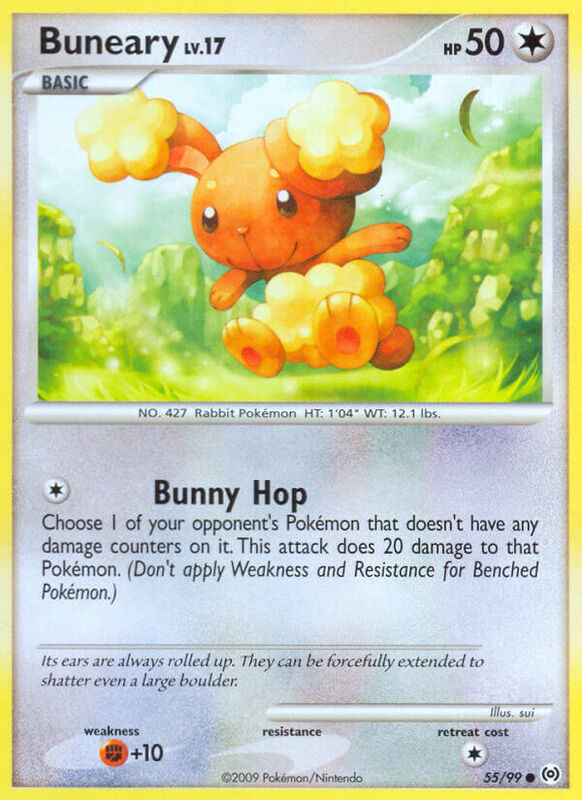 This power can’t be used if Lopunny is affected by a Special Condition. 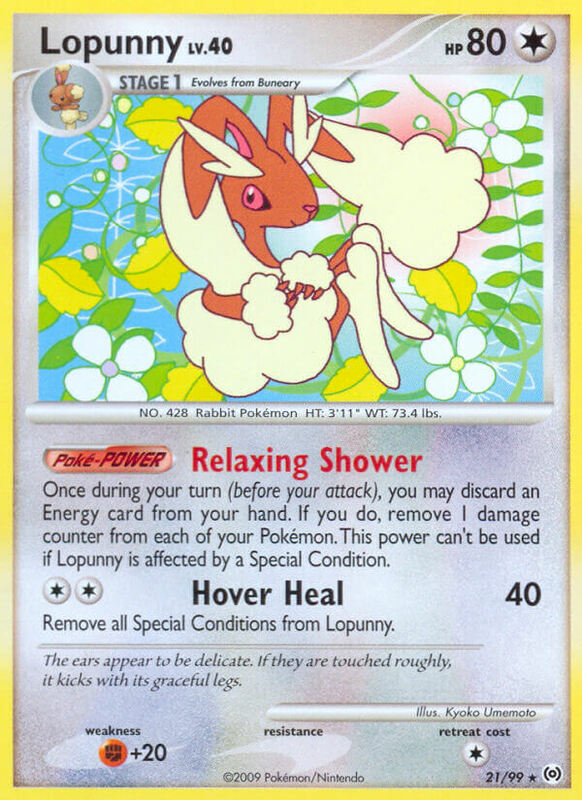 Remove all Special Conditions from Lopunny. It discharges electricity from its mane. 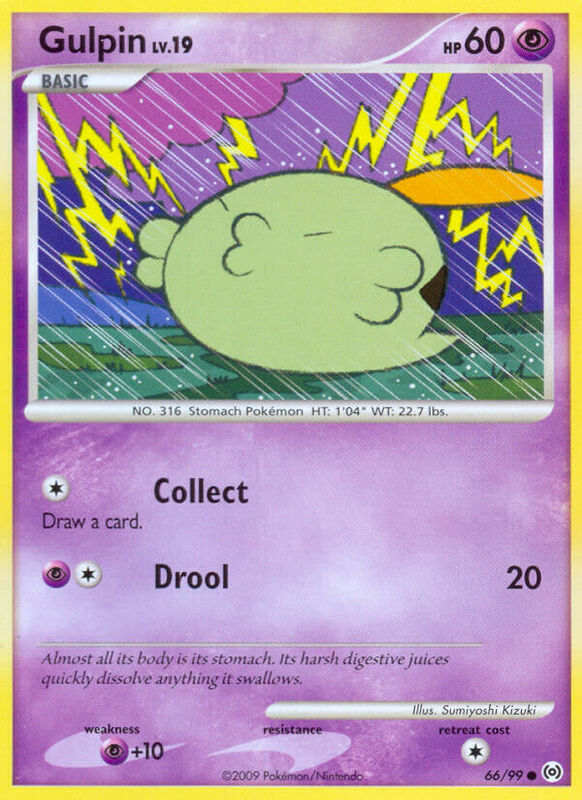 It creates a thundercloud overhead to drop lightning bolts. Choose 1 of your opponent’s Evolved Pokémon. 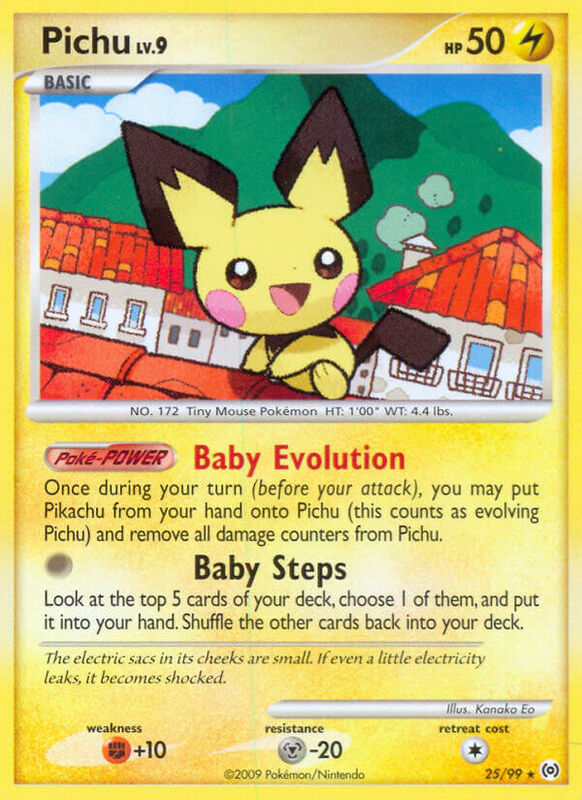 Remove the highest Stage Evolution card from that Pokémon and have your opponent shuffle that card into his or her deck. 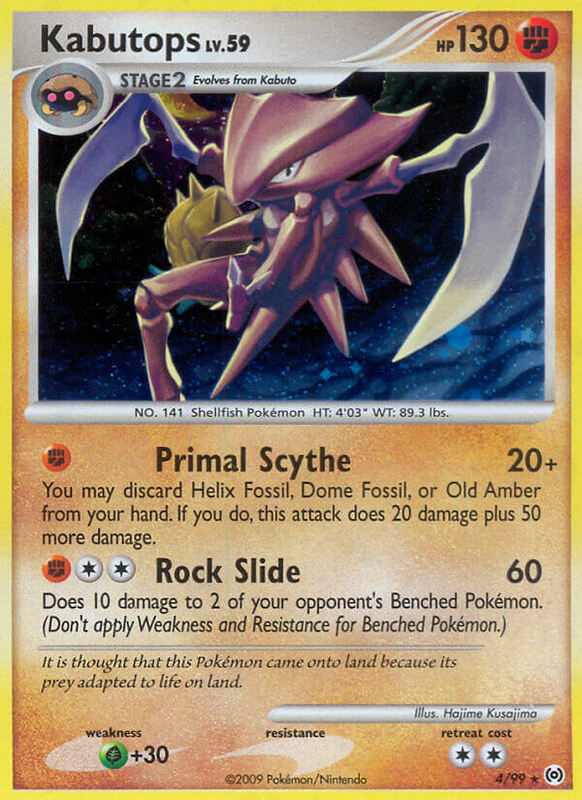 Does 30 damage plus 10 more damage for each Helix Fossil, Dome Fossil, and Old Amber in your discard pile. Flip a coin until you get tails. 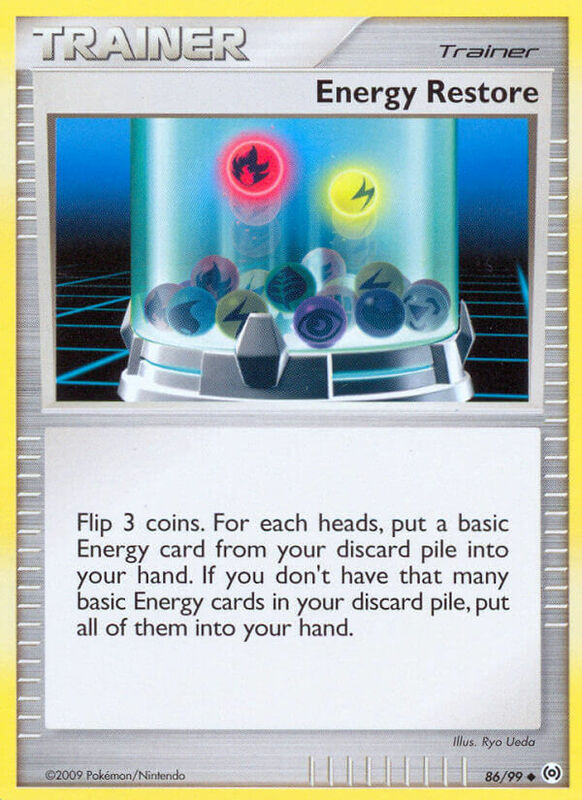 For each heads, discard an Energy card attached to the Defending Pokémon. 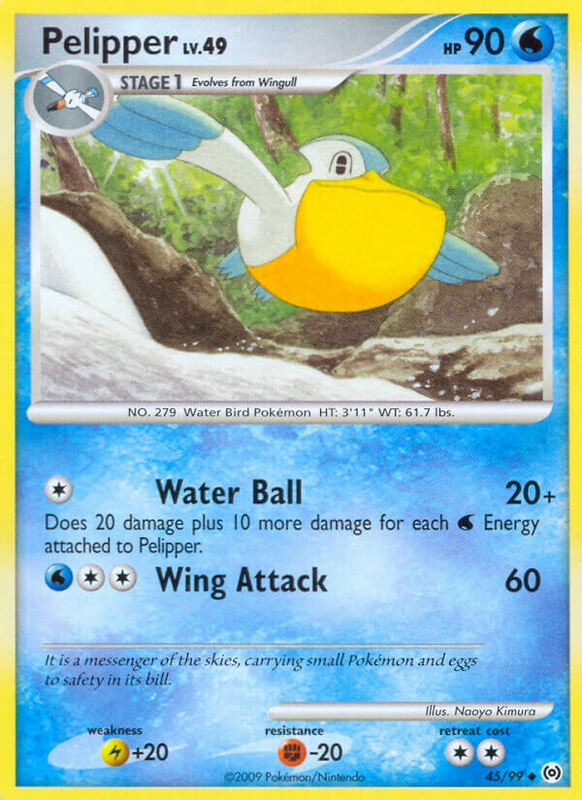 It is a messenger of the skies, carrying small Pokémon and eggs to safety in its bill. Look at the top 5 cards of your deck, choose 1 of them, and put it into your hand. Shuffle the other cards back into your deck. The electric sacs in its cheeks are small. If even a little electricity leaks, it becomes shocked. 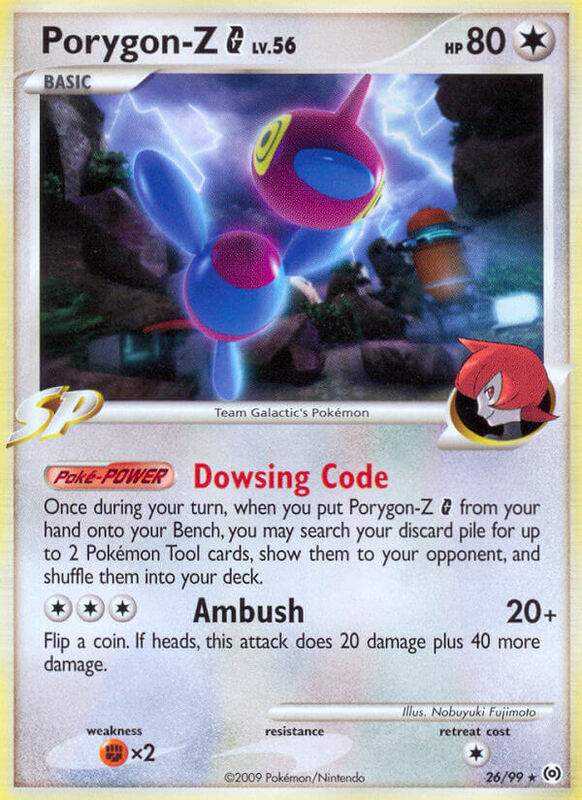 Once during your turn, when you put Porygon-Z G from your hand onto your Bench, you may search your discard pile for up to 2 Pokémon Tool cards, show them to your opponent, and shuffle them into your deck. Flip a coin. If heads, this attack does 20 damage plus 40 more damage. 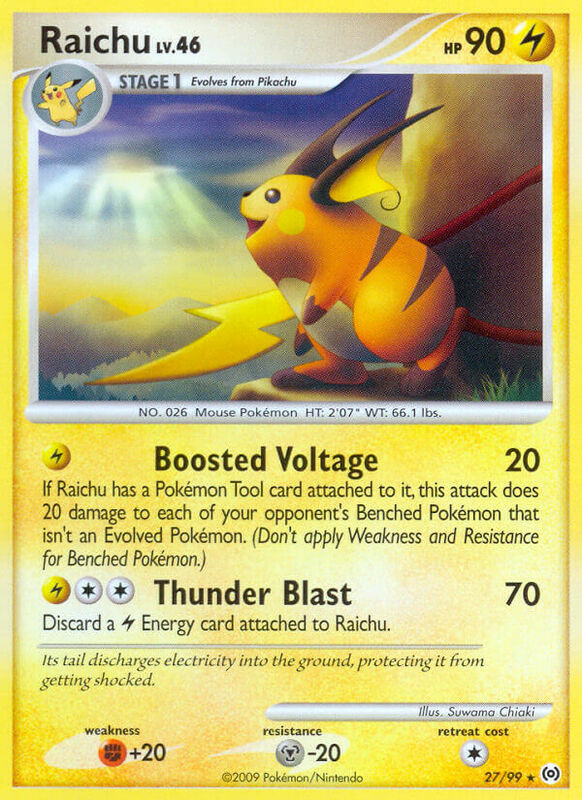 Discard a [L] Energy card attached to Raichu. 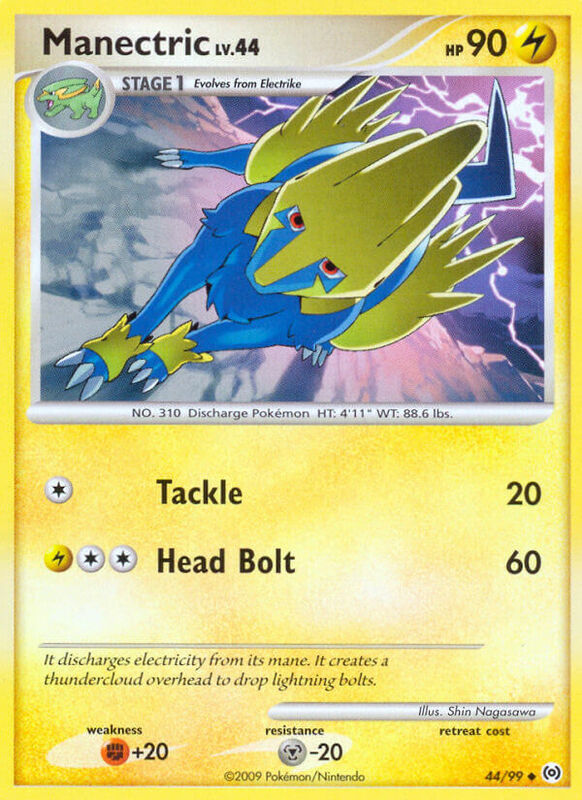 Its tail discharges electricity into the ground, protecting it from getting shocked. 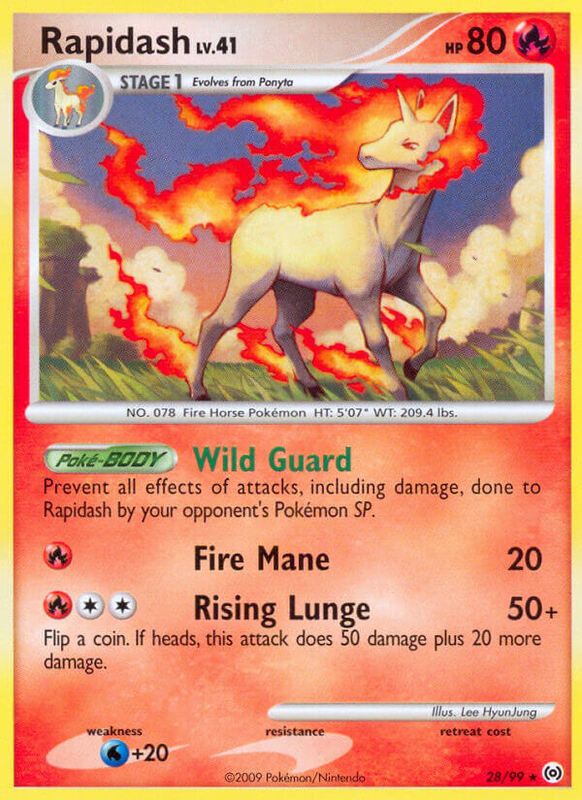 Prevent all effects of attacks, including damage, done to Rapidash by your opponent’s Pokémon SP. 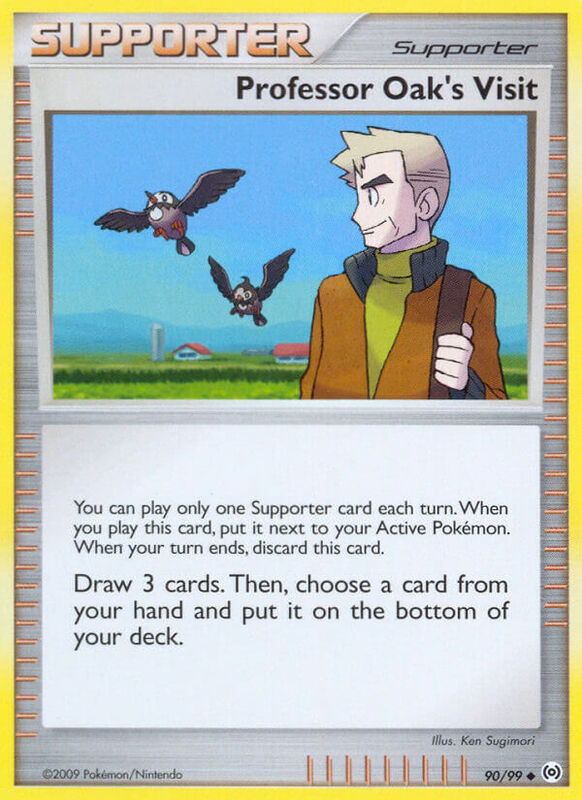 Look at your opponent’s hand, choose a Supporter card you find there, and discard it. 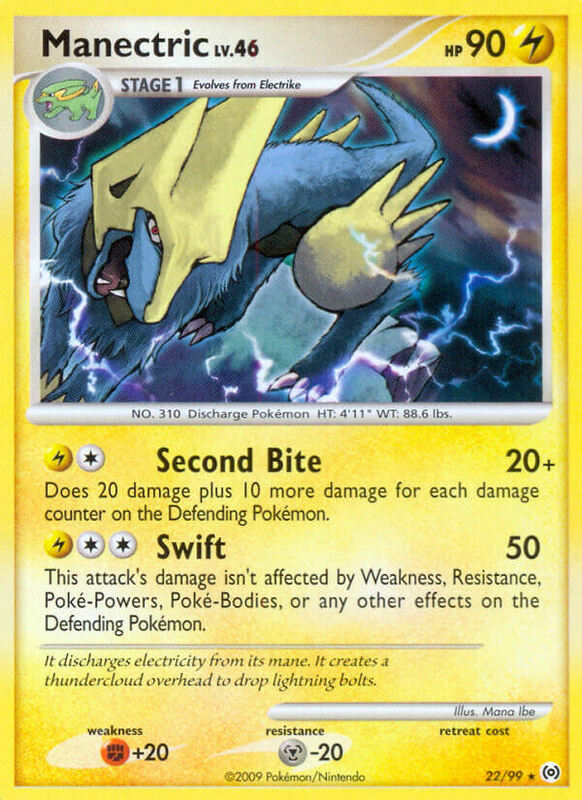 Then, use the effect of that card as the effect of this attack. 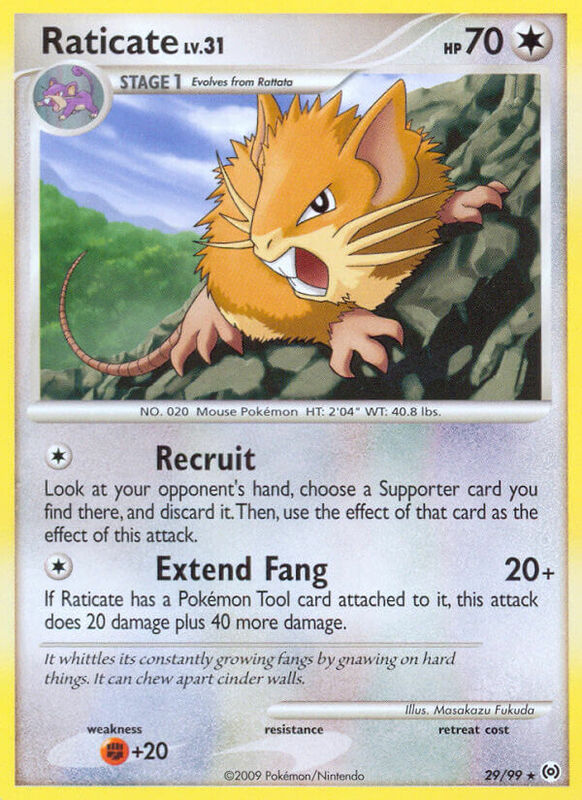 If Raticate has a Pokémon Tool card attached to it, this attack does 20 damage plus 40 more damage. 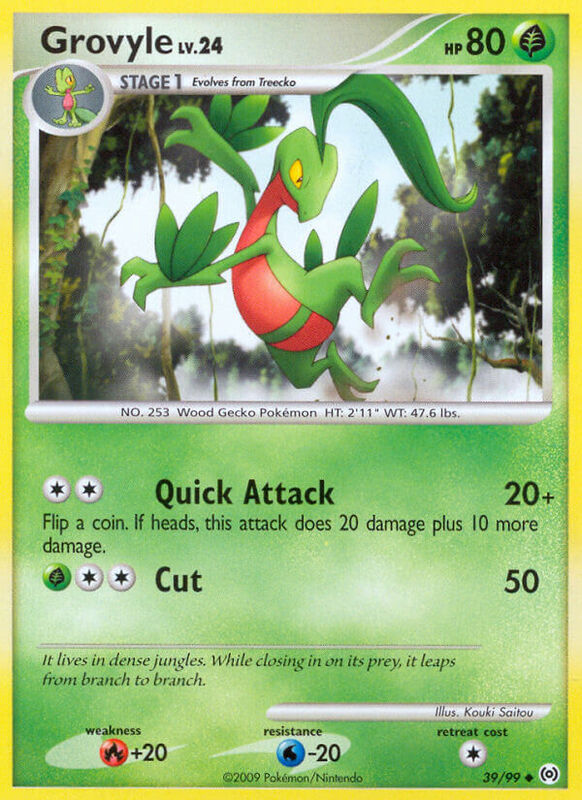 When you attach a [G] Energy card from your hand to Sceptile, remove 2 damage counters from Sceptile. 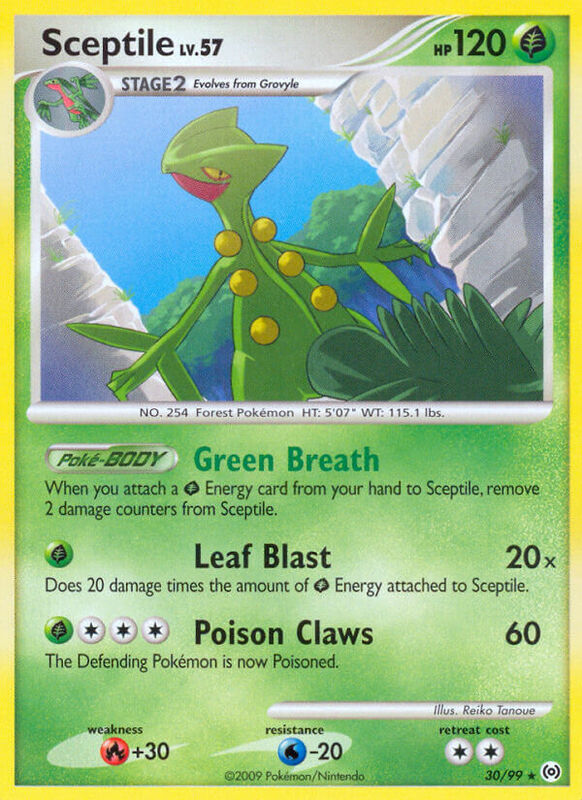 Does 20 damage times the amount of [G] Energy attached to Sceptile. 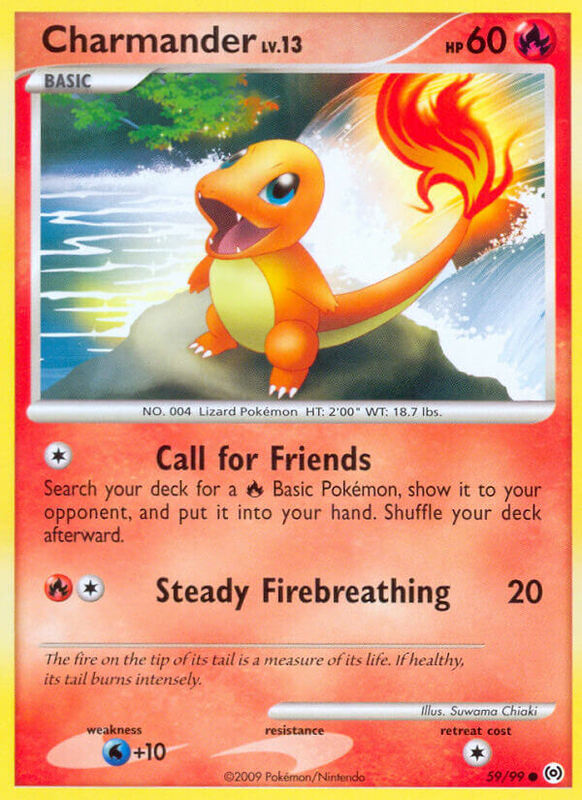 You may attach a basic Energy card from your hand to 1 of your Pokémon. 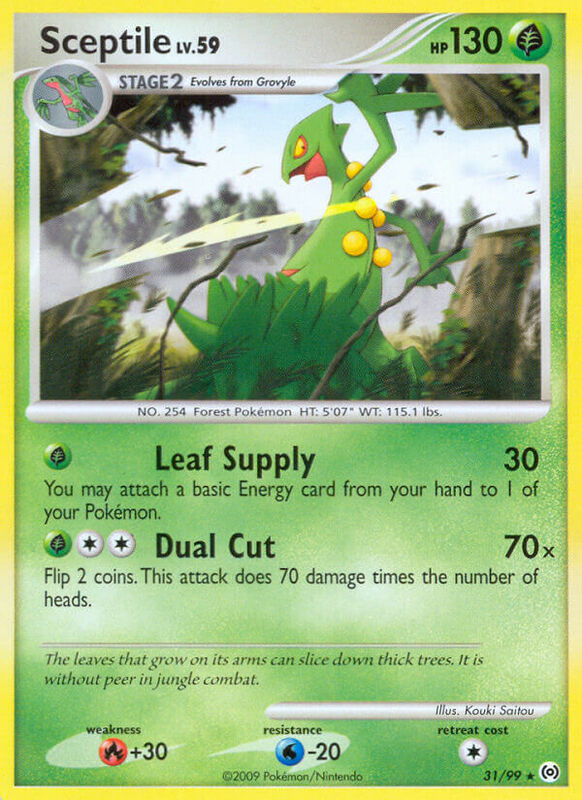 The leaves that grow on its arms can slice down thick trees. It is without peer in jungle combat. 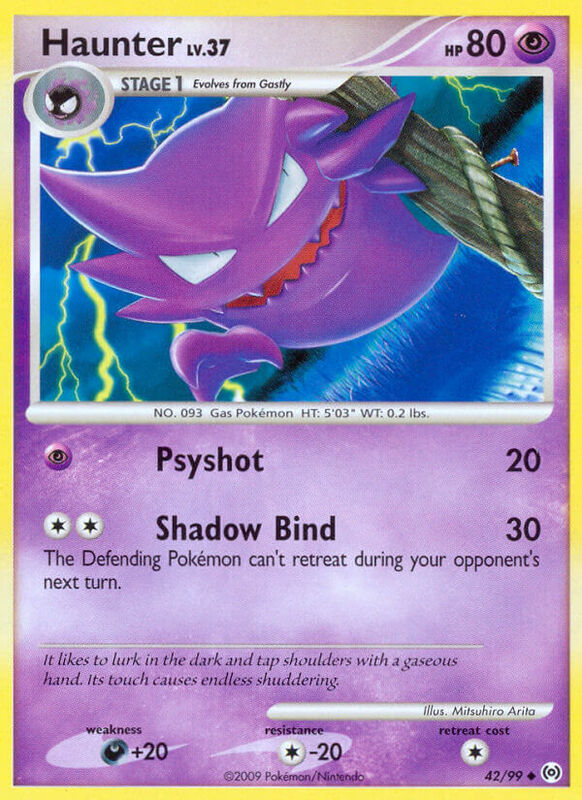 As long as Spiritomb is your Active Pokémon, each player can’t play any Trainer cards from his or her hand. 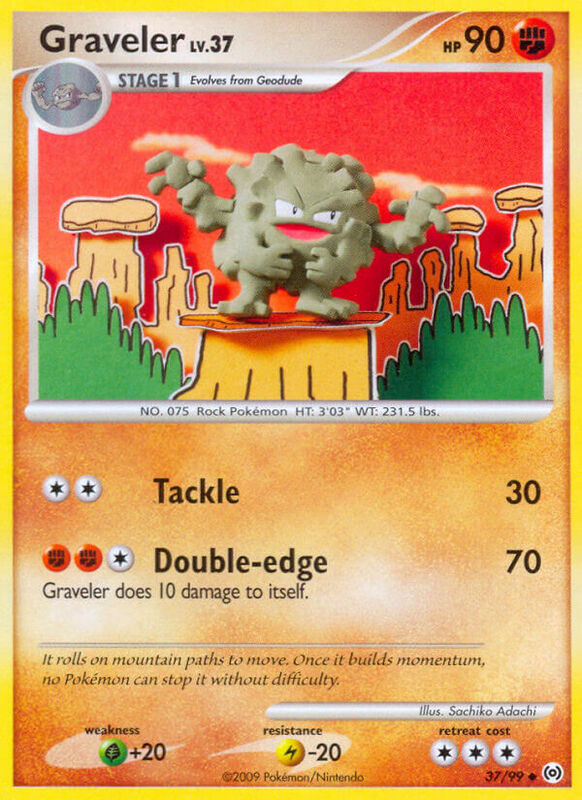 Search your deck for a card that evolves from 1 of your Pokémon and put it onto that Pokémon. (This counts as evolving that Pokémon.) If you do, put 1 damage counter on Spiritomb. Shuffle your deck afterward. If you have the same number of cards in your hand as your opponent, this attack does 30 damage plus 30 more damage. There are researchers who believe this Pokémon reflected like a mirror in the distant past. Born from gases, anyone would faint if engulfed by its gaseous body, which contains poison. Graveler does 10 damage to itself. Flip a coin. 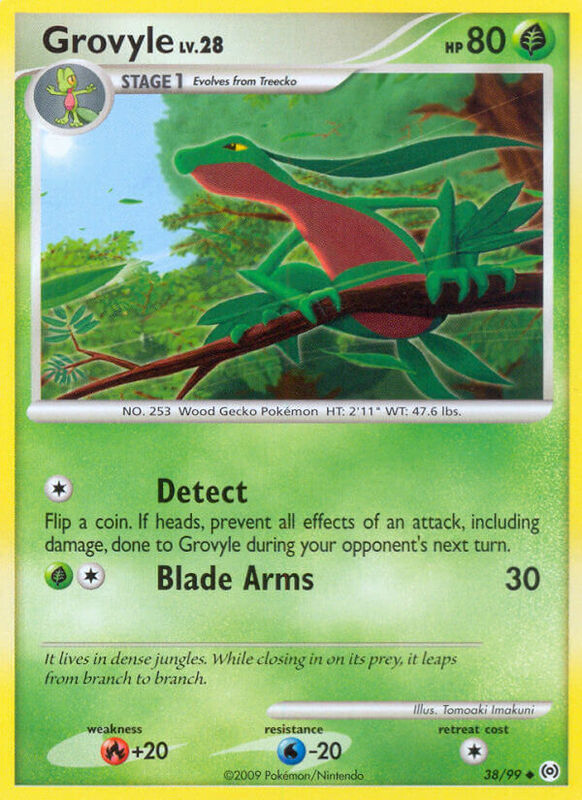 If heads, prevent all effects of an attack, including damage, done to Grovyle during your opponent’s next turn. Flip a coin. 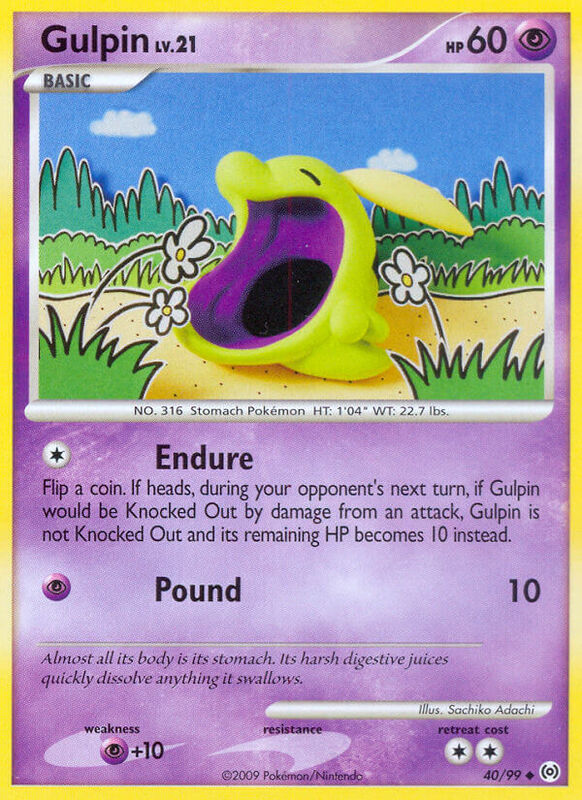 If heads, during your opponent’s next turn, if Gulpin would be Knocked Out by damage from an attack, Gulpin is not Knocked Out and its remaining HP becomes 10 instead. Almost all of its body is its stomach. Its harsh digestive juices quickly dissolve anything it swallows. 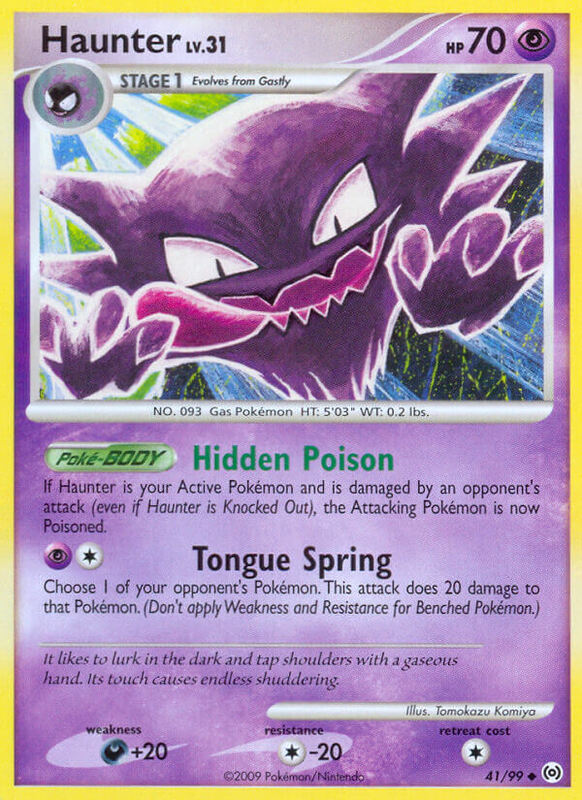 If Haunter is your Active Pokémon and is damaged by an opponent’s attack (even if Haunter is Knocked Out), the Attacking Pokémon is now Poisoned. It likes to lurk in the dark and tap shoulders with a gaseous hand. Its touch causes endless shuddering. 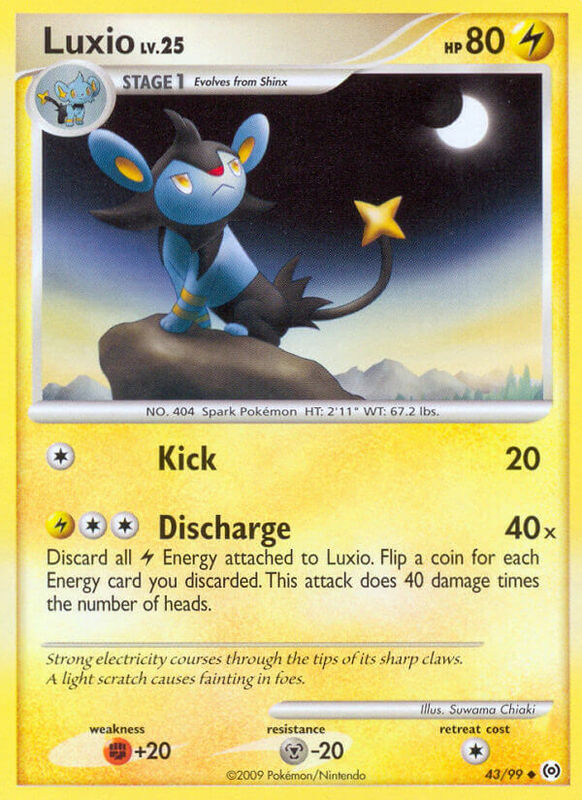 Discard all [L] Energy attached to Luxio. Flip a coin for each Energy card you discarded. This attack does 40 damage times the number of heads. Does 20 damage plus 10 more damage for each [W] Energy attached to Pelipper. 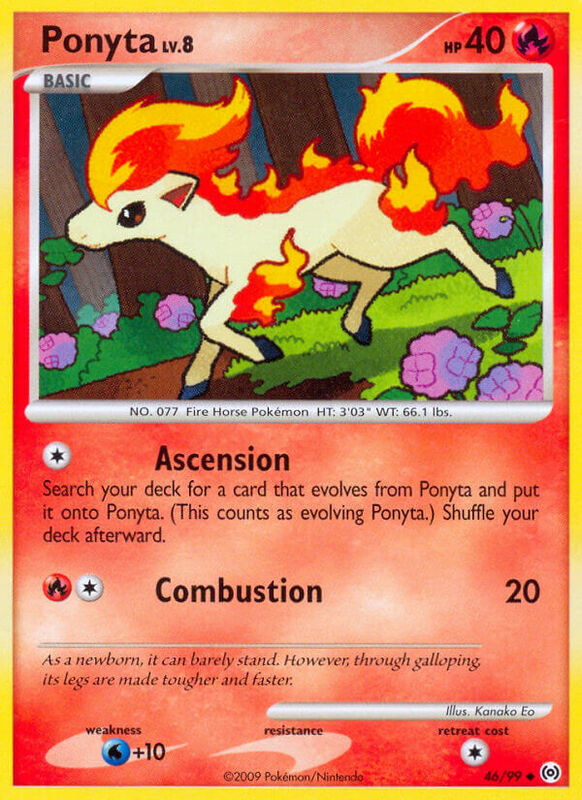 Search your deck for a card that evolves from Ponyta and put it onto Ponyta. 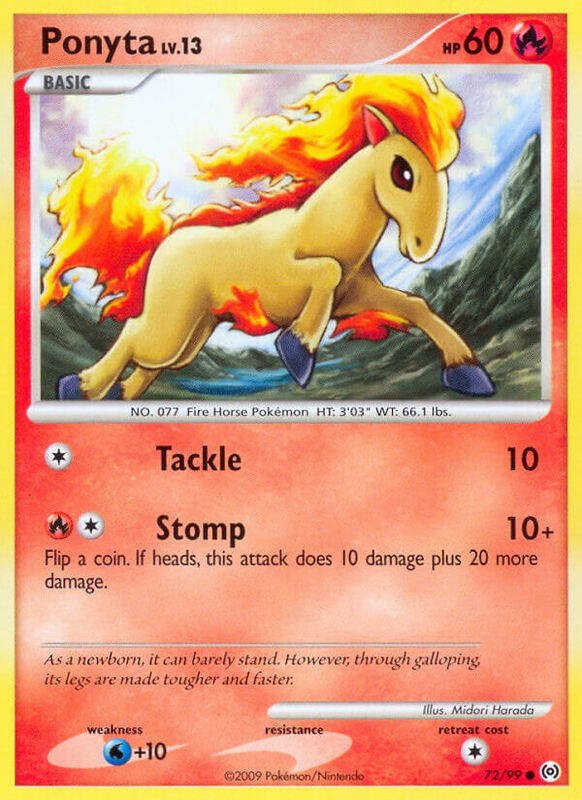 (This counts as evolving Ponyta.) Shuffle your deck afterward. As a newborn, it can barely stand. However, through galloping, its legs are made tougher and faster. When at an all-out gallop, its blazing mane sparkles, enhancing its beautiful appearance. Flip a coin. 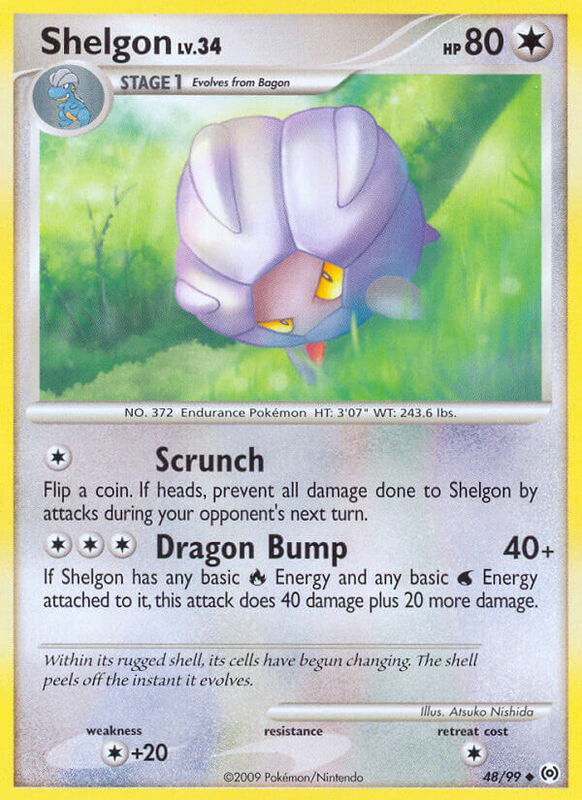 If heads, prevent all damage done to Shelgon during your opponent’s next turn. If Shelgon has any basic [R] Energy and any basic [W] Energy attached to it, this attack does 40 damage plus 20 more damage. 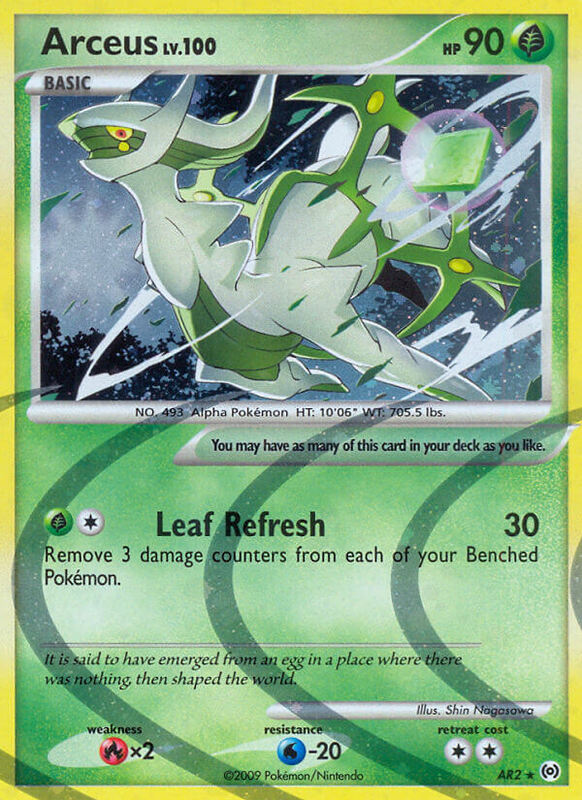 Remove 2 damage counters from 1 of your Benched Pokémon. 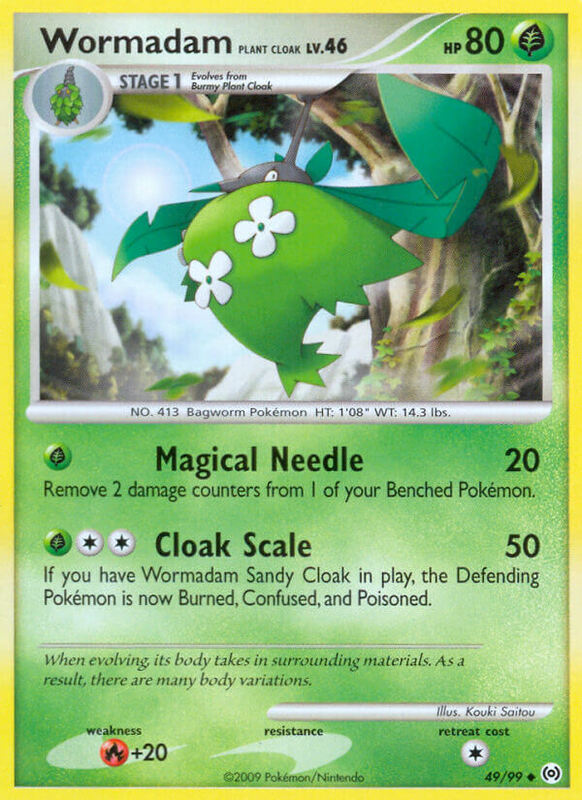 If you have Wormadam Sandy Cloak in play, the Defending Pokémon is now Burned, Confused, and Poisoned. 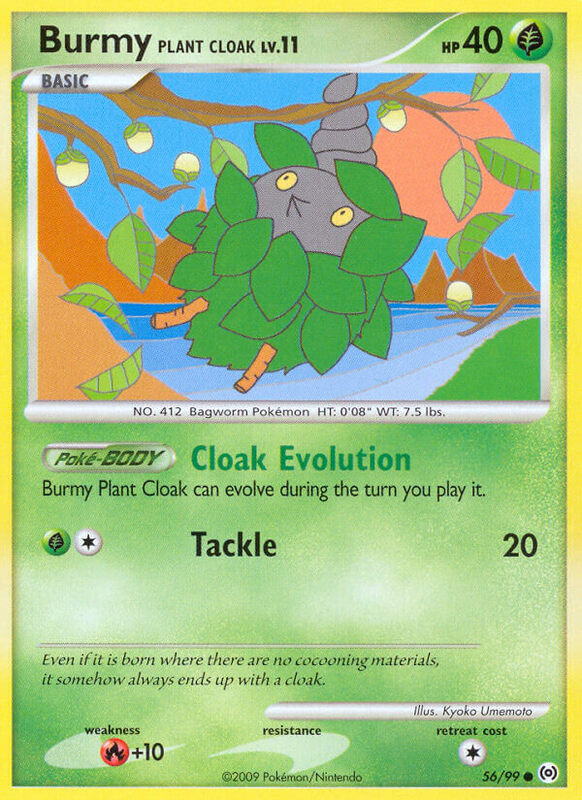 When evolving, its body takes in surrounding materials. As a result, there are many body variations. If you have Wormadam Trash Cloak in play, this attack does 60 damage plus 30 more damage. You may search your opponent’s discard pile for any 1 card, show it to your opponent, and put it on top of his or her deck. 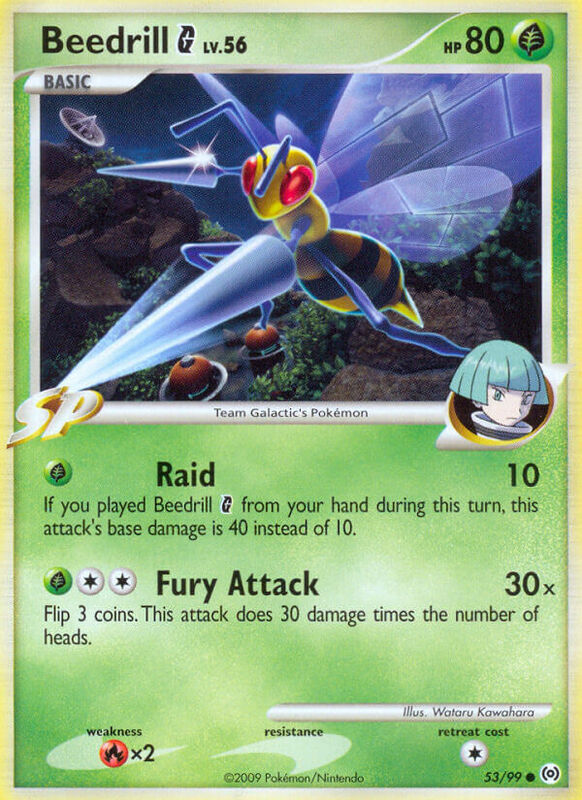 If you played Beedrill G from your hand during this turn, this attack’s base damage is 40 instead of 10. 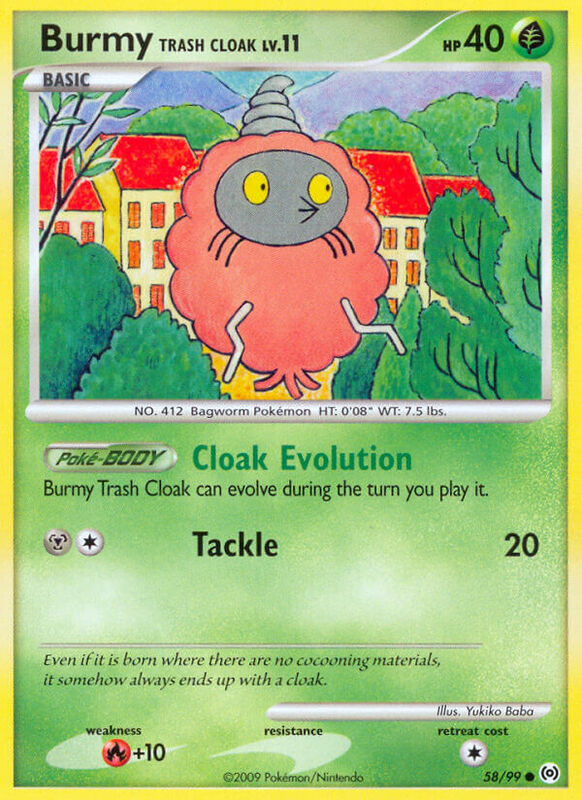 Burmy Trash Cloak can evolve during the turn you play it. 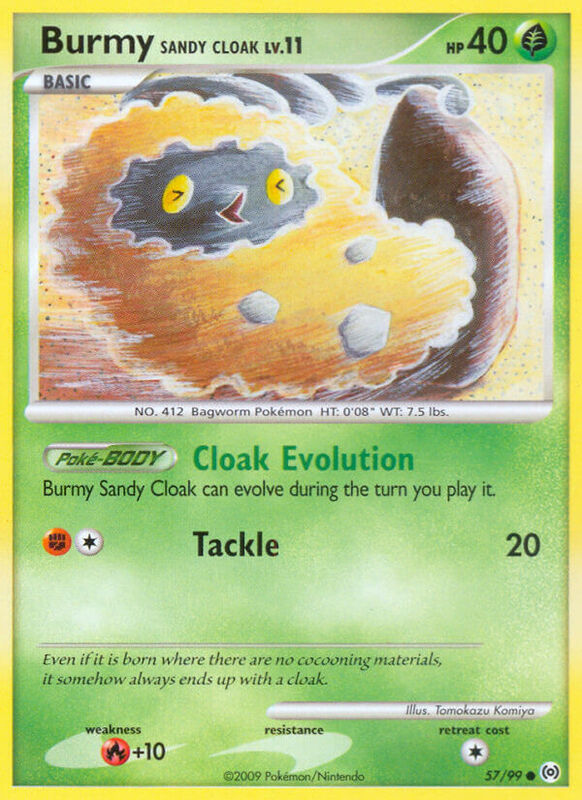 Burmy Sandy Cloak can evolve during the turn you play it. 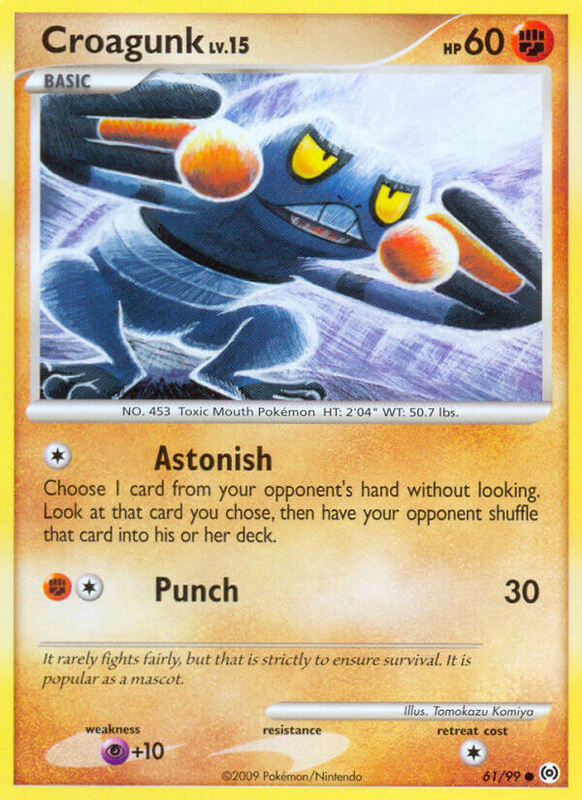 Search your deck for a [R] Basic Pokémon, show it to your opponent, and put it into your hand. Shuffle your deck afterward. The fire on the tip of its tail is a measure of its life. If healthy, its tail burns intensely. The small ball is not only full of nutrients, it is also tasty. Starly try to peck it off. Choose 1 card from your opponent’s hand without looking. Look at that card you chose, then have your opponent shuffle that card into his or her deck. Flip a coin. If tails, Electrike does 10 damage to itself. Using electricity stored in its fur, it stimulates its muscles to heighten its reaction speed. At rest, it looks just like a rock. 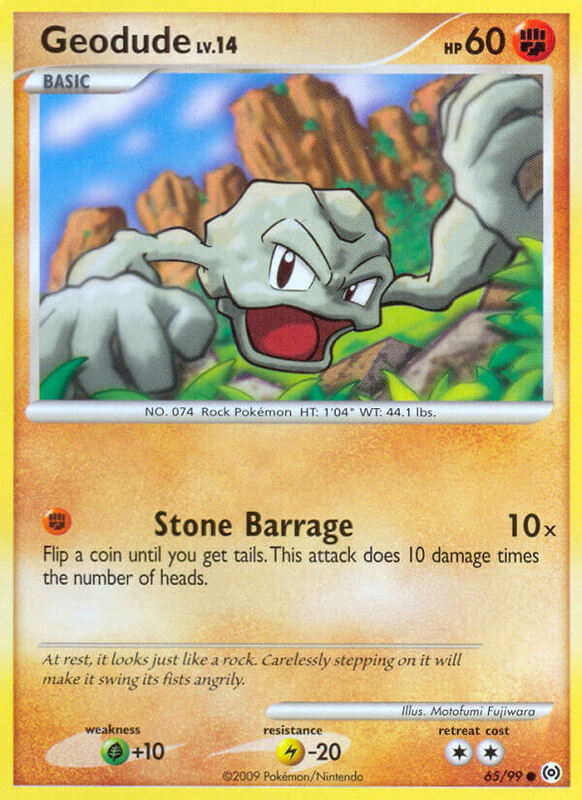 Carelessly stepping on it will make it swing its fists angrily. 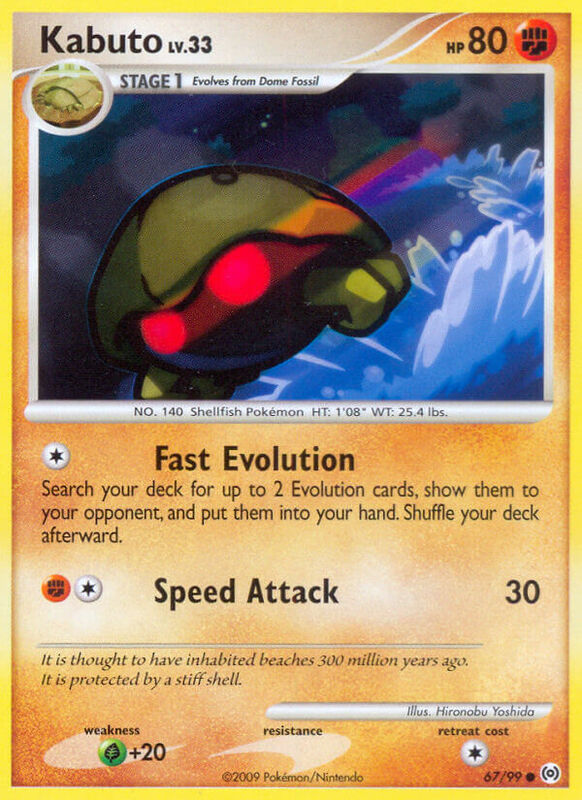 Search your deck for up to 2 Evolution cards, show them to your opponent, and put them into your hand. Shuffle your deck afterward. It is thought to have inhabited beaches 300 million years ago. It is protected by a stiff shell. It toughens its body by slamming into thick trees. Many snapped trees can be found near its nest. 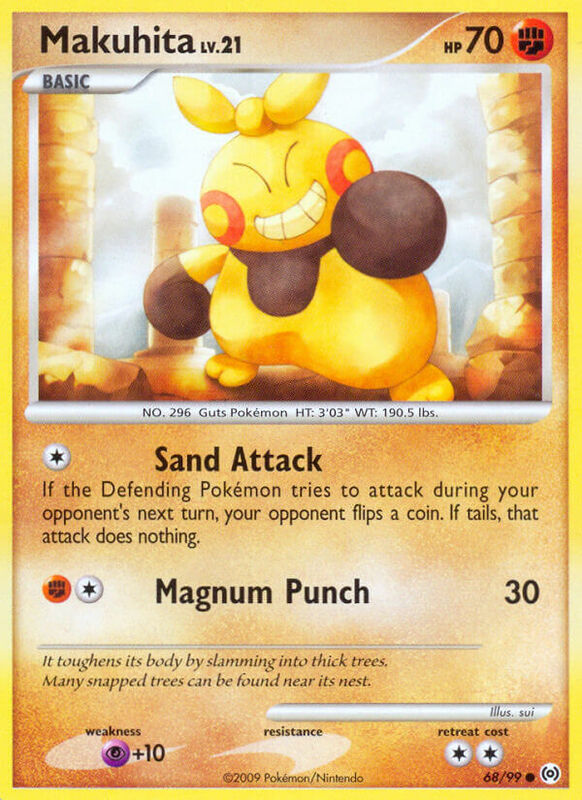 During your opponent’s next turn, if Nosepass would be damaged by an attack, prevent that attack’s damage done to Nosepass if that damage is 30 or less. A Pokémon that was resurrected from a fossil using modern science. It swam in ancient seas. 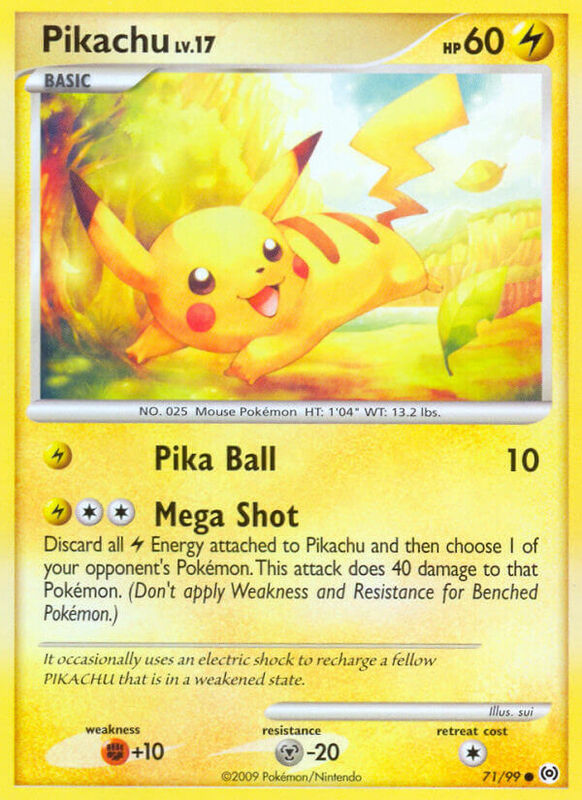 It occasionally uses an electric shock to recharge a fellow Pikachu that is in a weakened state. The extension and contraction of its muscles generates electricity. It glows when in trouble. 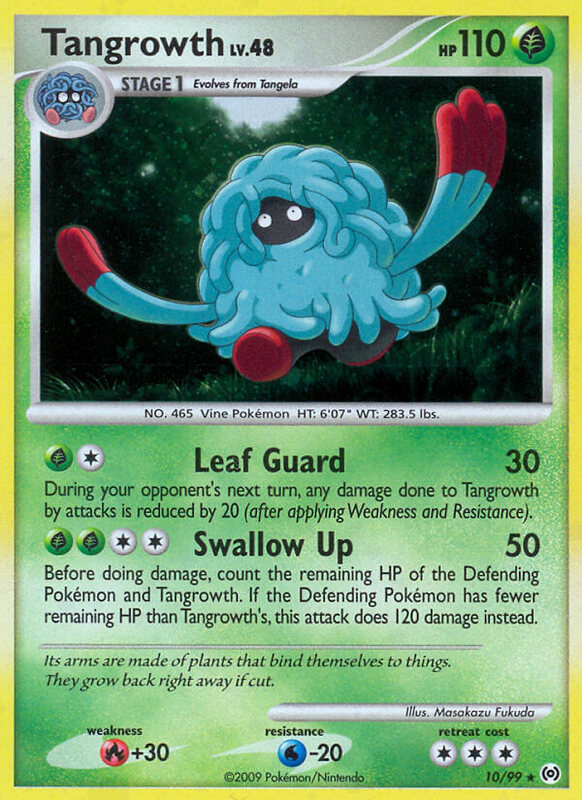 Remove 1 damage counter from Tangela. The blue vines shrouding its body are covered in a growth of fine hair. It is known to be ticklish. 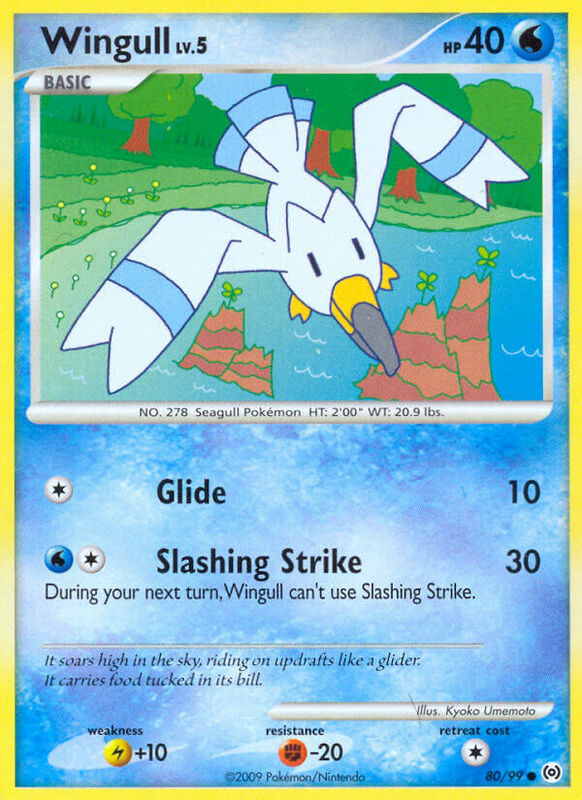 During your next turn, Wingull can’t use Slashing Strike. It soars high in the sky, riding on updrafts like a glider. It carries food tucked in its bill. 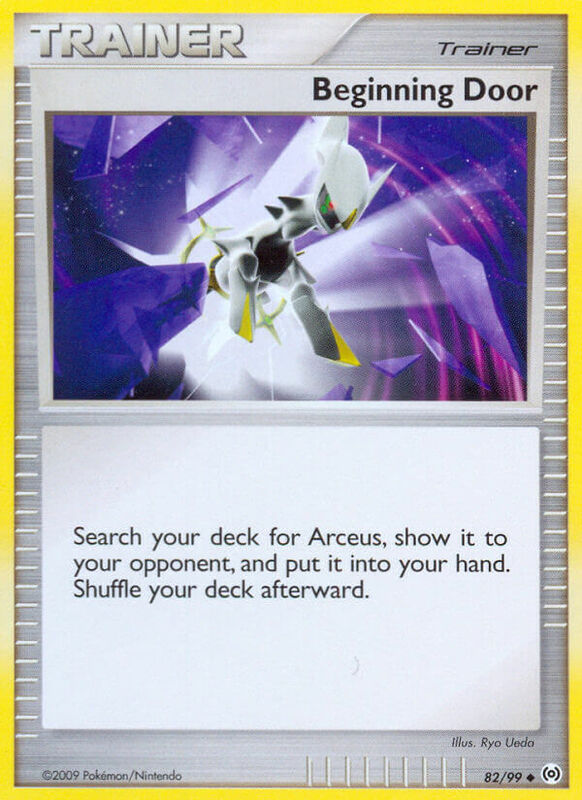 Search your deck for Arceus, show it to your opponent, and put it into your hand. Shuffle your deck afterward. Attach Bench Shield to 1 of your Pokémon that doesn’t already have a Pokémon Tool attached to it. 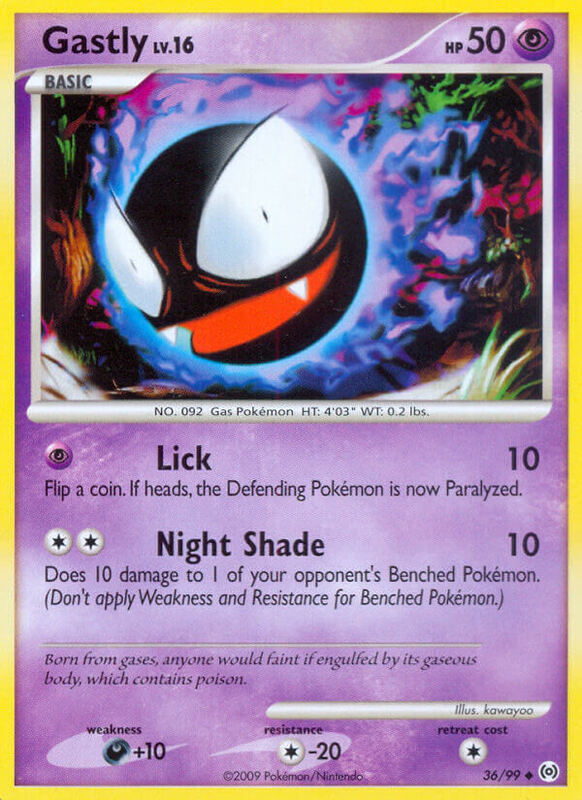 If that Pokémon is Knocked Out, discard this card. 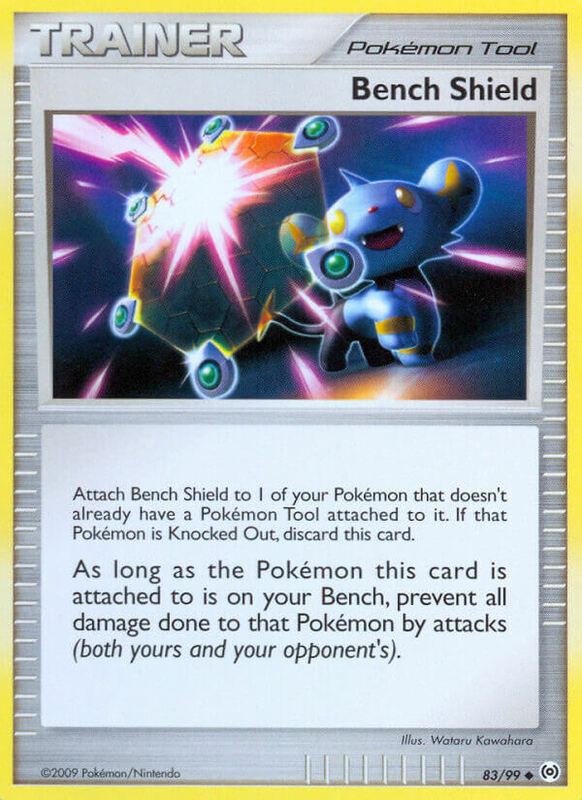 As long as the Pokémon this card is attached to is on your Bench, prevent all damage done to that Pokémon by attacks (both yours and your opponent’s). 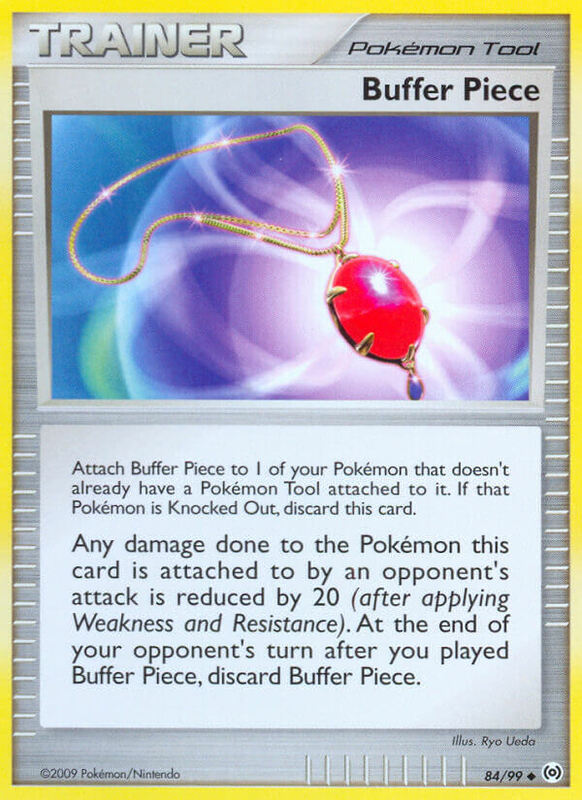 Attach Buffer Piece to 1 of your Pokémon that doesn’t already have a Pokémon Tool attached to it. 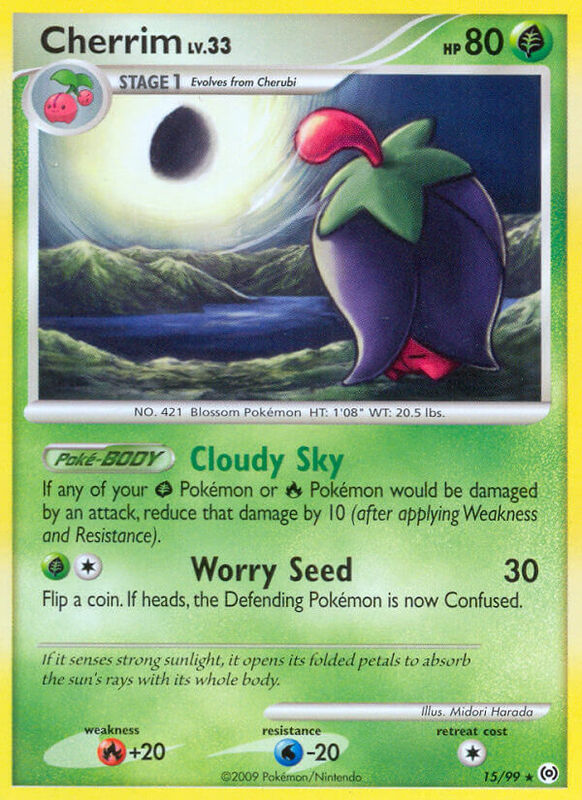 If that Pokémon is Knocked Out, discard this card. 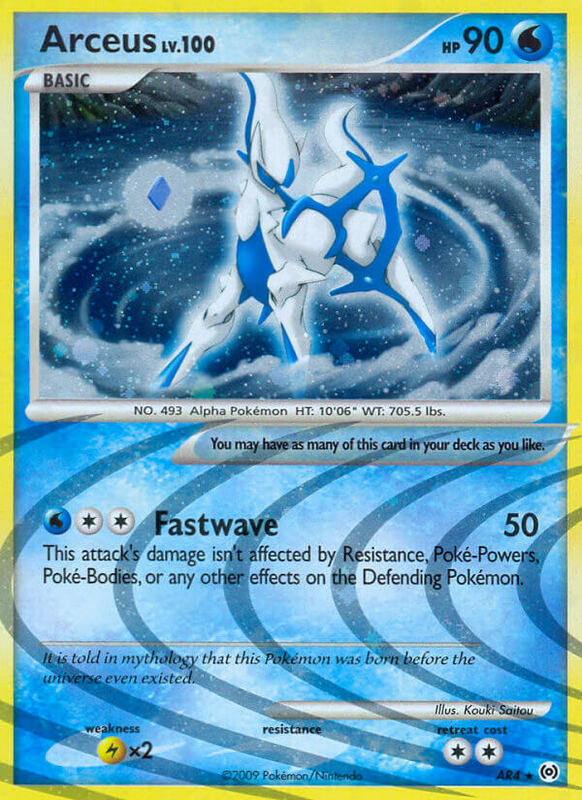 Any damage done to the Pokémon this card is attached to by an opponent’s attack is reduced by 20 (after applying Weakness and Resistance). At the end of your opponent’s turn after you played Buffer Piece, discard Buffer Piece. 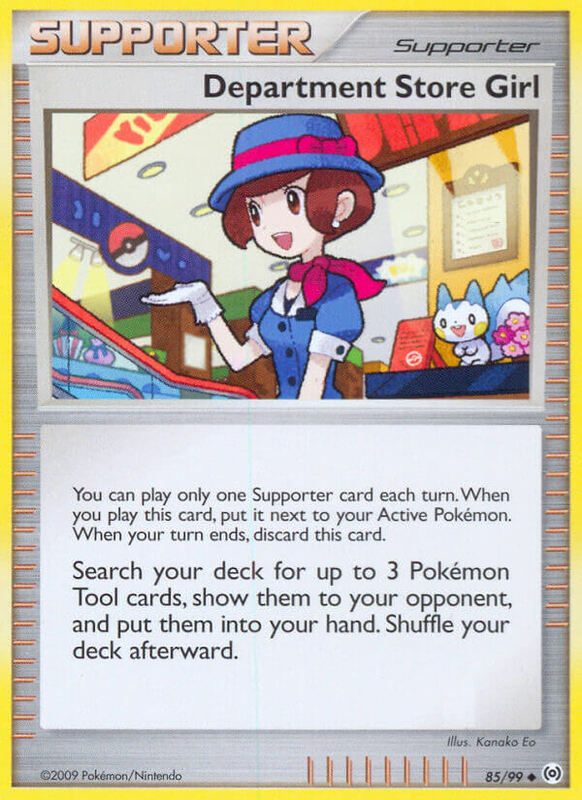 Search your deck for up to 3 Pokémon Tool cards, show them to your opponent, and put them into your hand. Shuffle your deck afterward. Flip 3 coins. For each heads, put a basic Energy card from your discard pile into your hand. If you don’t have that many basic Energy cards in your discard pile, put all of them into your hand. 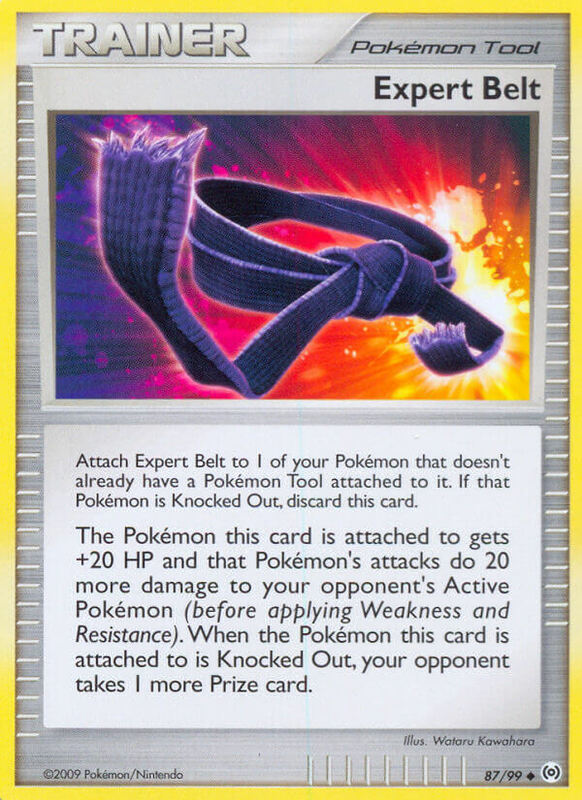 Attach Expert Belt to 1 of your Pokémon that doesn’t already have a Pokémon Tool attached to it. 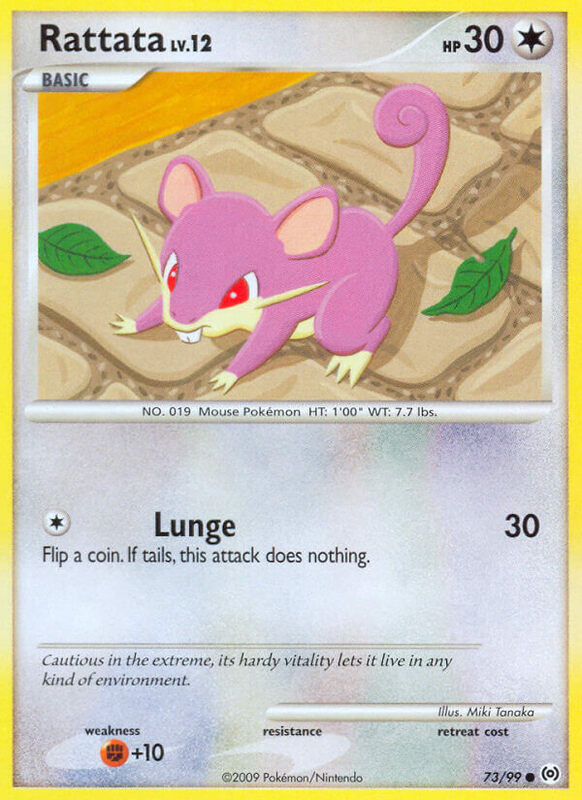 If that Pokémon is Knocked Out, discard this card. 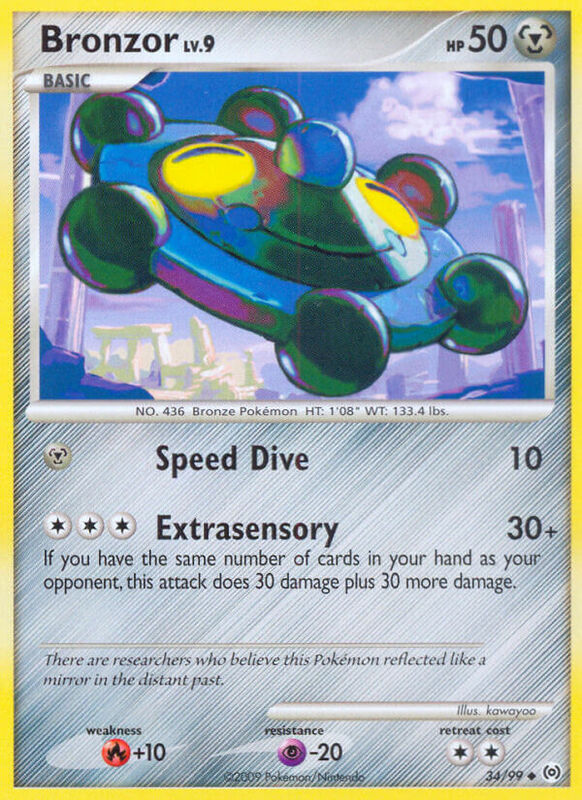 The Pokémon this card is attached to gets +20 HP and that Pokémon’s attacks do 20 more damage to your opponent’s Active Pokémon (before applying Weakness and Resistance). 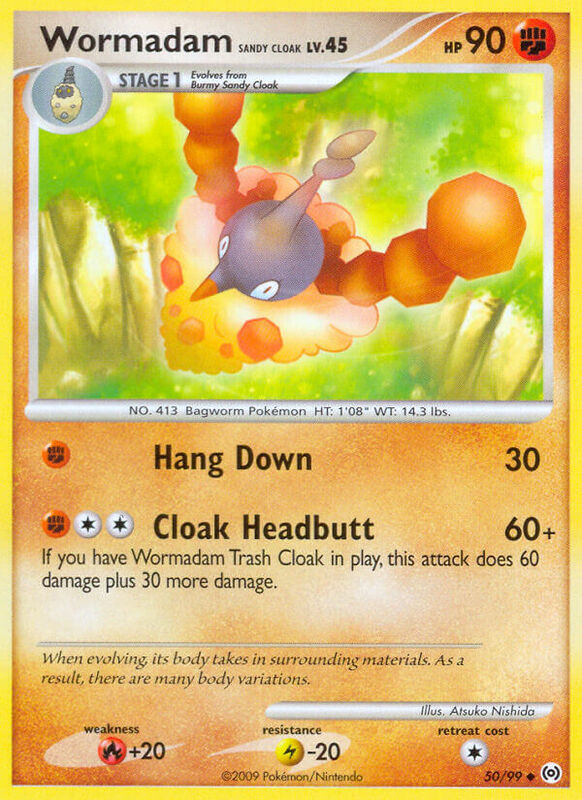 When the Pokémon this card is attached to is Knocked Out, your opponent takes 1 more Prize card. 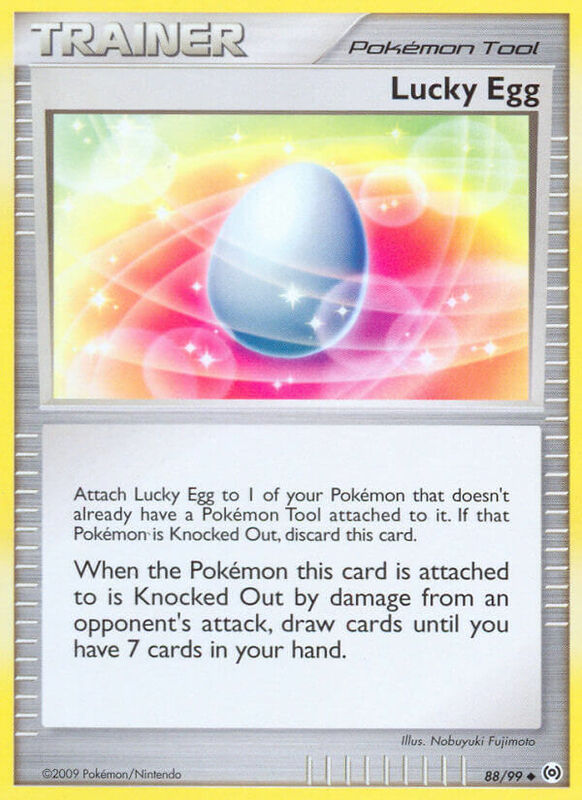 Attach Lucky Egg to 1 of your Pokémon that doesn’t already have a Pokémon Tool attached to it. 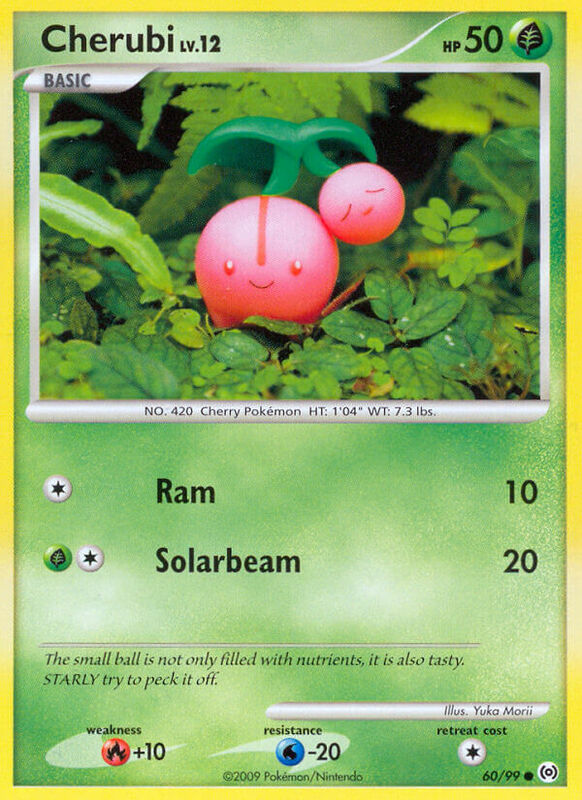 If that Pokémon is Knocked Out, discard this card. 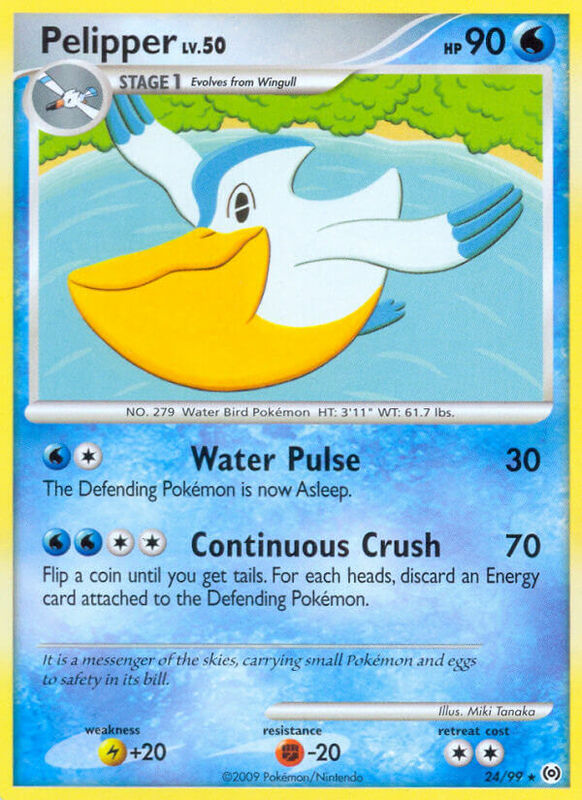 When the Pokémon this card is attached to is Knocked Out by damage from an opponent’s attack, draw cards until you have 7 cards into your hands. 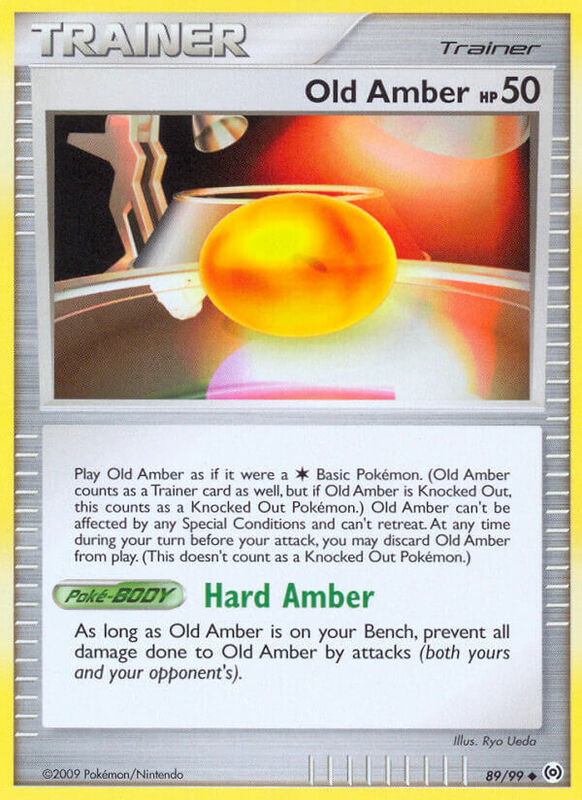 As long as Old Amber is on your Bench, prevent all damage done to Old Amber by attacks (both yours and your opponent’s). Draw 3 cards. Then, choose a card from your hand and put it on the bottom of your deck. 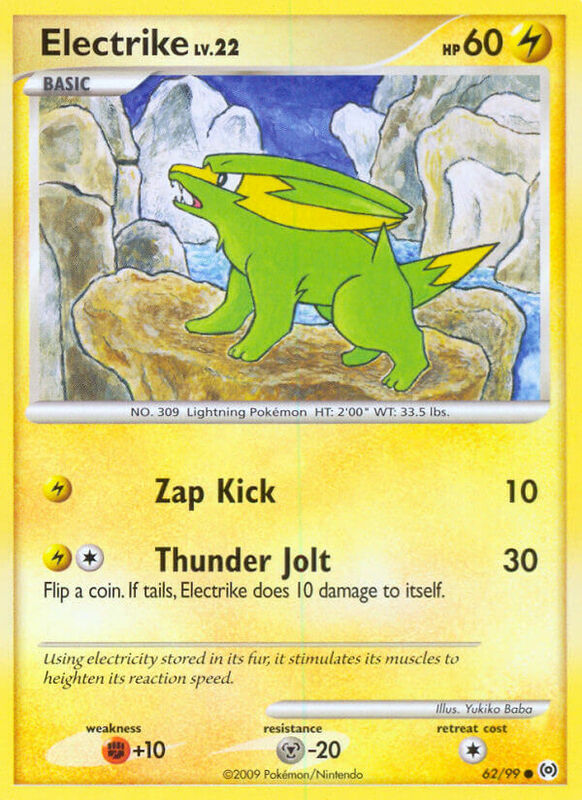 During each player’s turn, the player may move an Energy card attached to 1 of his or her Benched Pokémon to his or her Active Arceus as often as he or she likes. 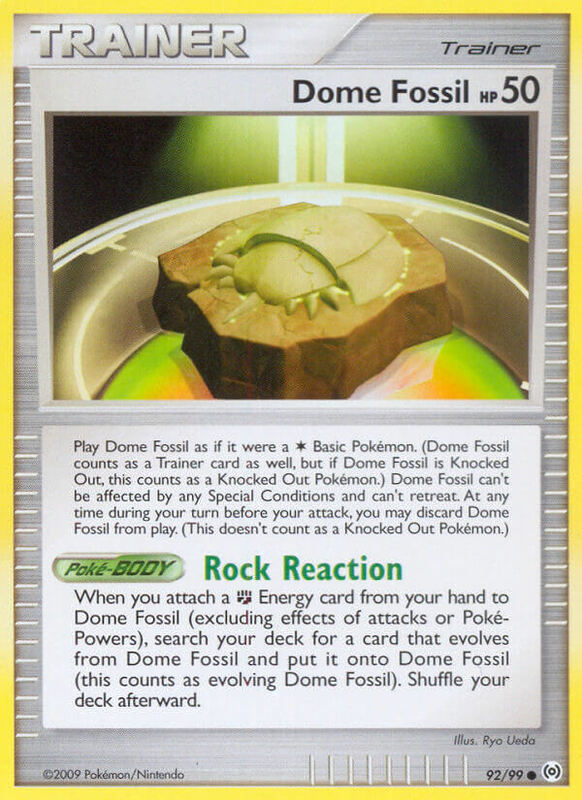 When you attach a [F] Energy card from your hand to Dome Fossil (excluding effects of attacks or Poké-Powers), search your deck for a card that evolves from Dome Fossil and put it onto Dome Fossil (this counts as evolving Dome Fossil). Shuffle your deck afterward. 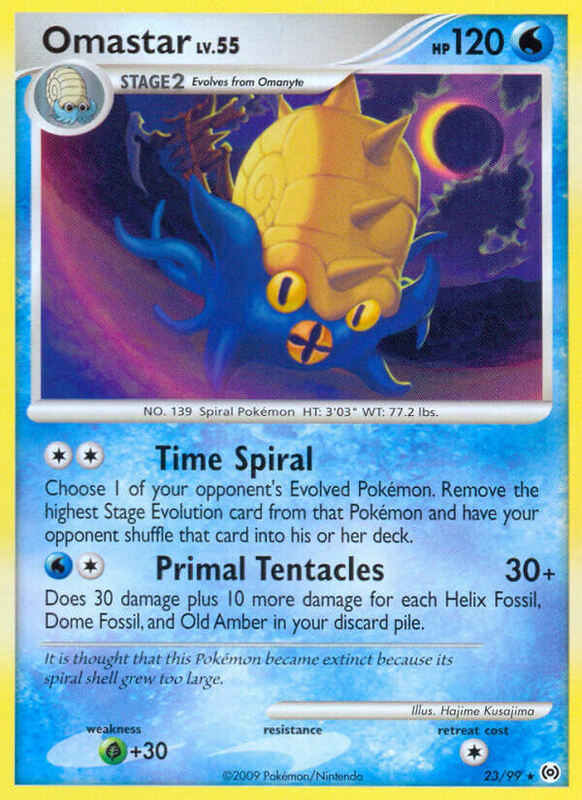 When you attach a [W] Energy card from your hand to Helix Fossil (excluding effects of attacks or Poké-Powers), search your deck for a card that evolves from Helix Fossil and put it onto Helix Fossil (this counts as evolving Helix Fossil). Shuffle your deck afterwards. 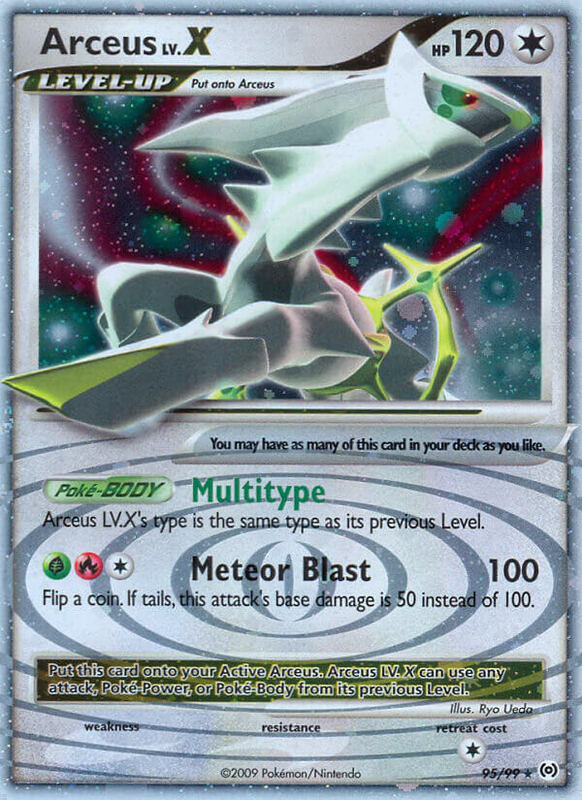 Arceus LV.X‘s type is the same type as its previous Level. 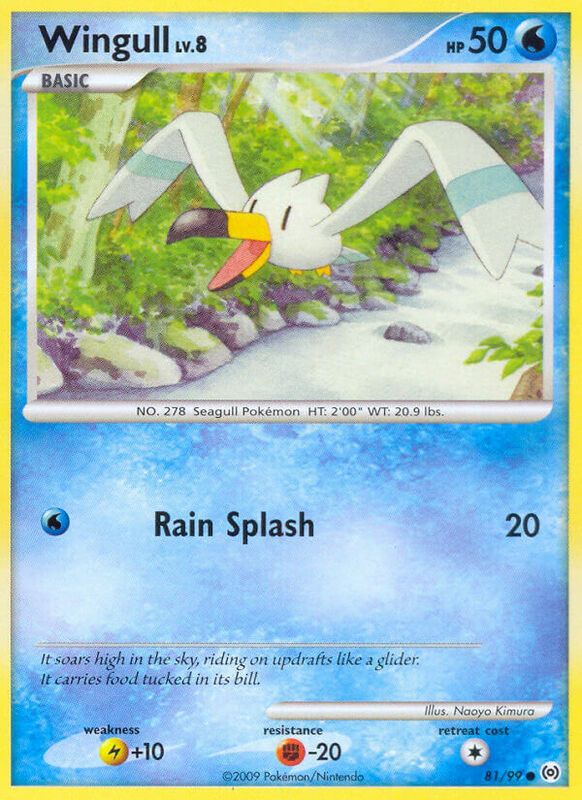 Put this card onto your Active Arceus. 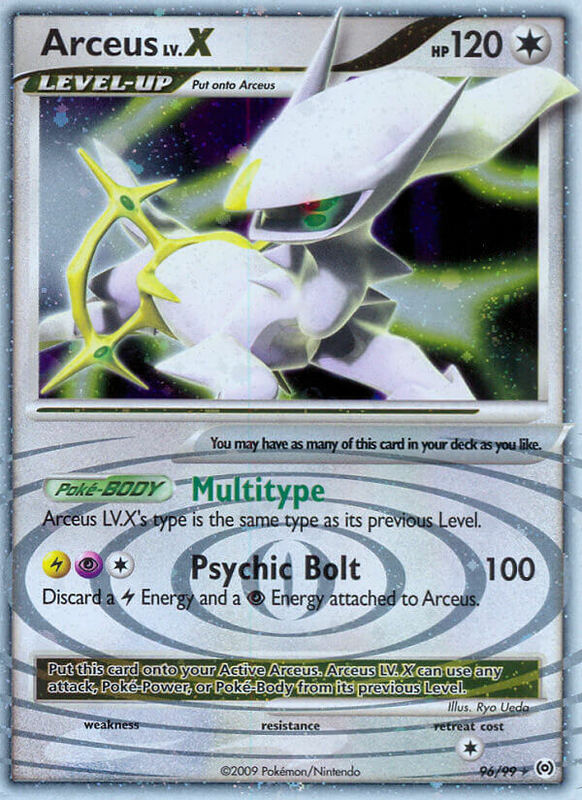 Arceus LV.X can use any attack, Poké-Power, or Poké-Body from its previous level. 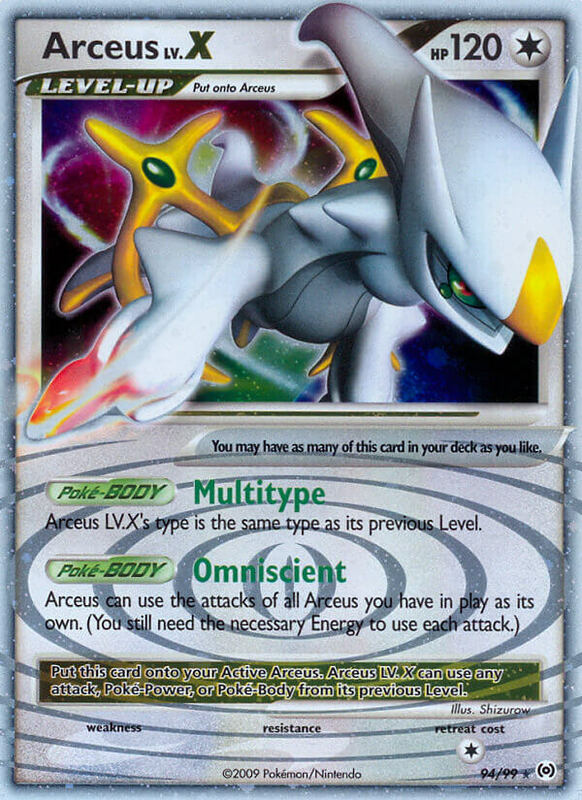 Arceus LV.X‘s type is the same as its previous Level. Flip a coin. If tails, this attack’s base damage is 50 instead of 100. 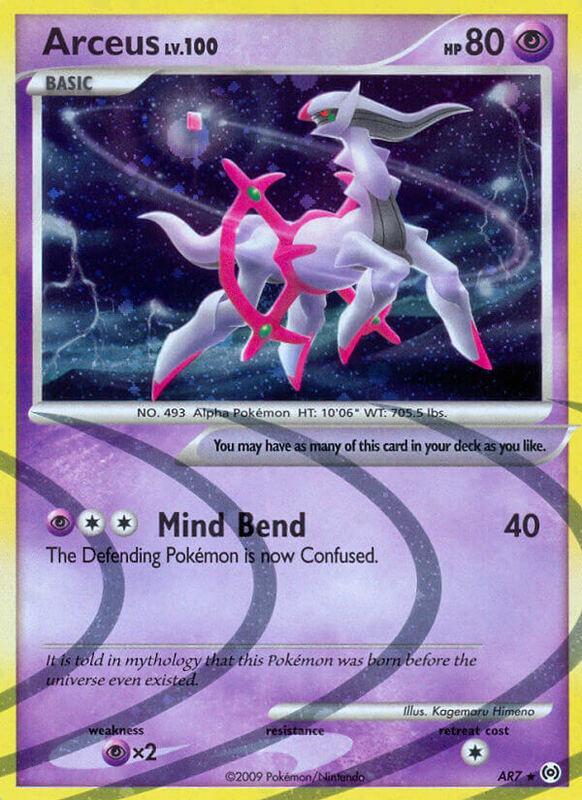 Discard a [L] Energy and a [P] Energy attached to Arceus. Once during your turn (before your attack), you may choose 1 of your opponent’s Pokémon LV.X. 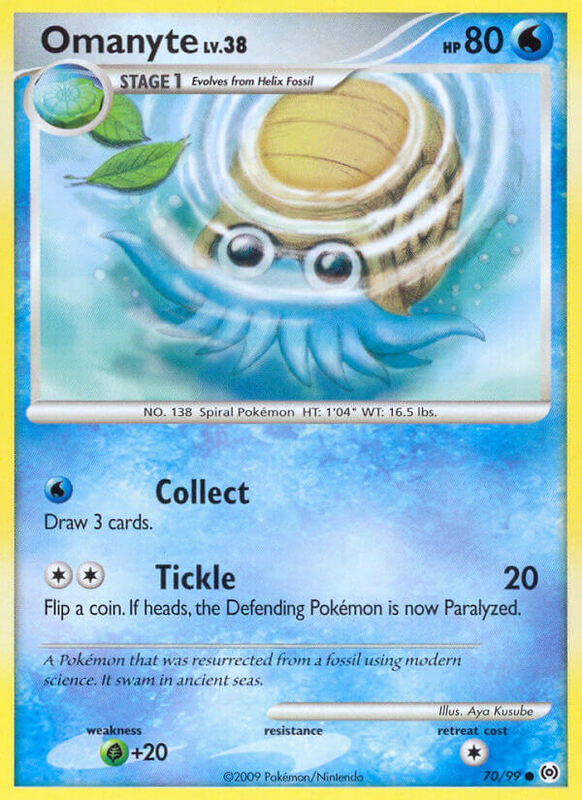 Remove the Level-Up card from that Pokémon and have your opponent shuffle the card into his or her deck. 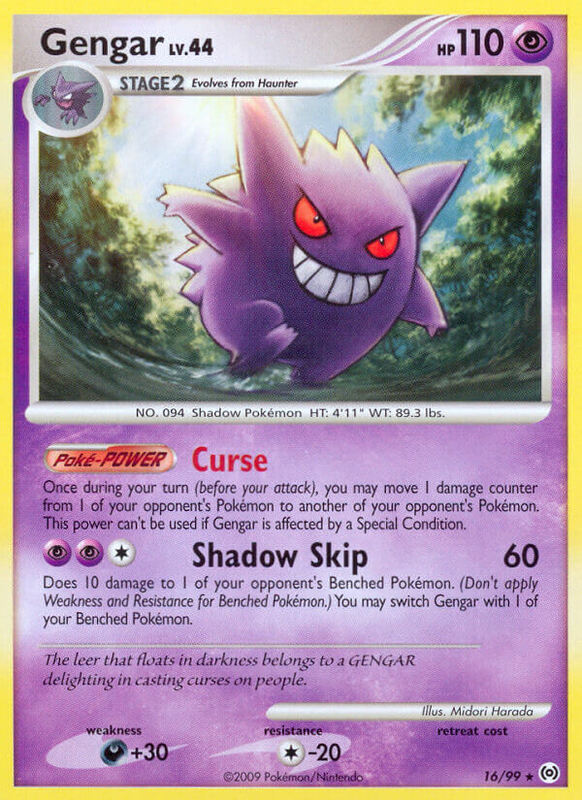 The power can’t be used if Gengar is affected by a Special Condition. 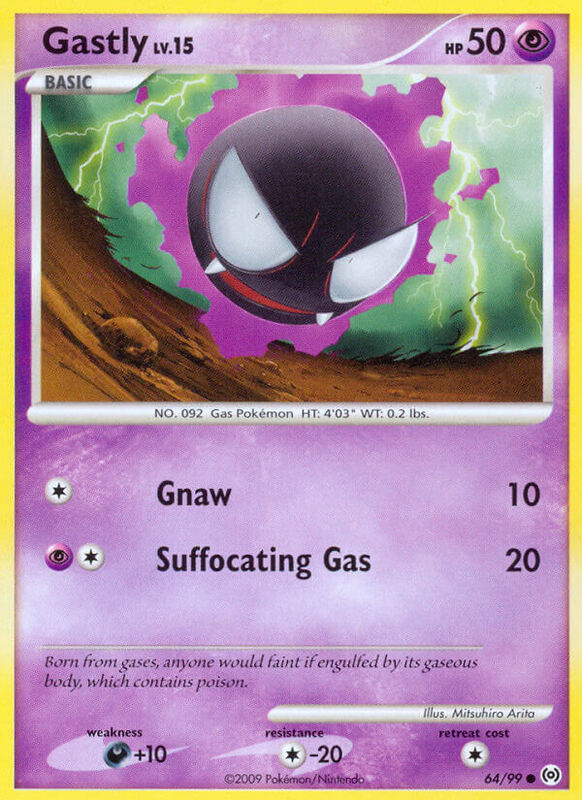 Put this card onto your Active Gengar. 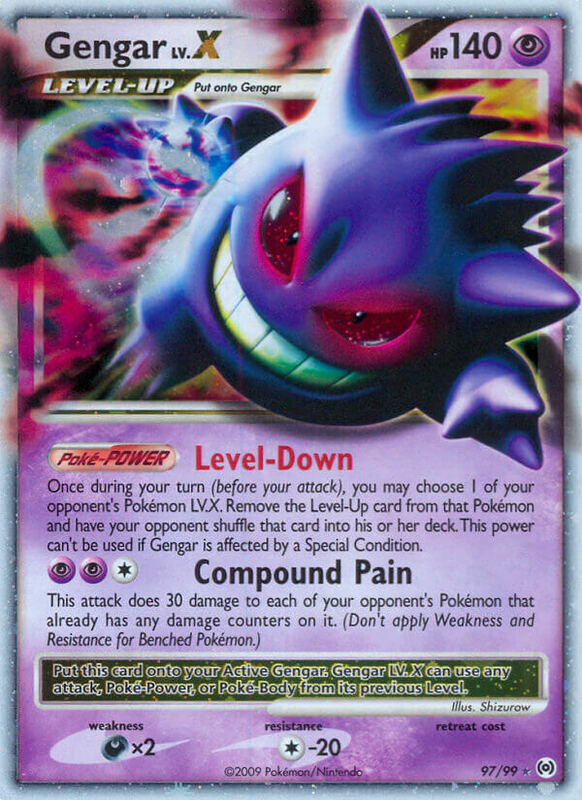 Gengar LV.X can use any attack, Poké-Power, or Poké-Body from its previous level. Once during your turn (before your attack), when you put Salamence LV.X from your hand onto your Active Salamence, you may use this power. 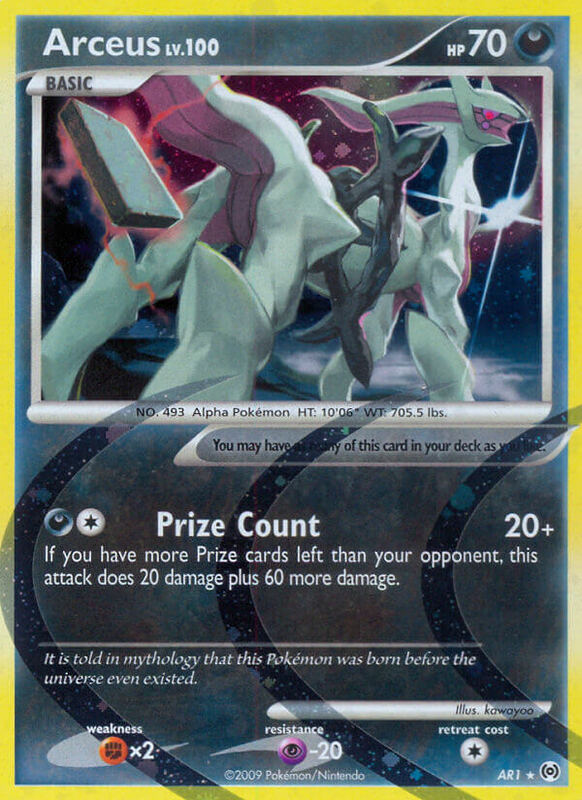 For each of your opponent’s Pokémon that is Knocked Out by damage from Salamence’s attacks this turn, take 1 more Prize card. 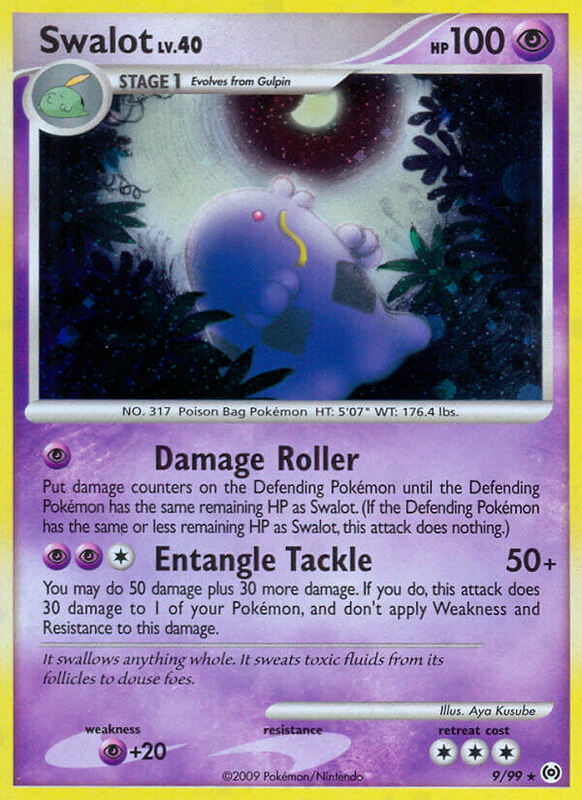 Discard an Energy card attached to Salamence. 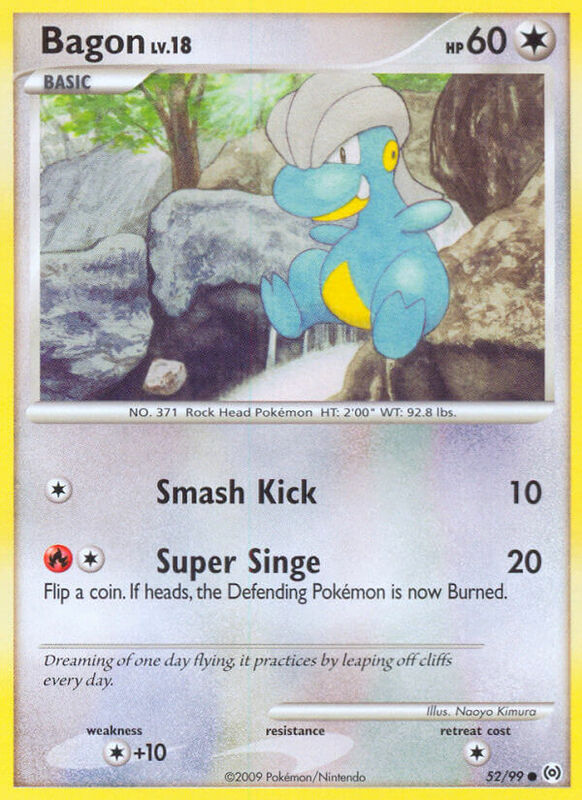 Put this card onto your Active Salamence. 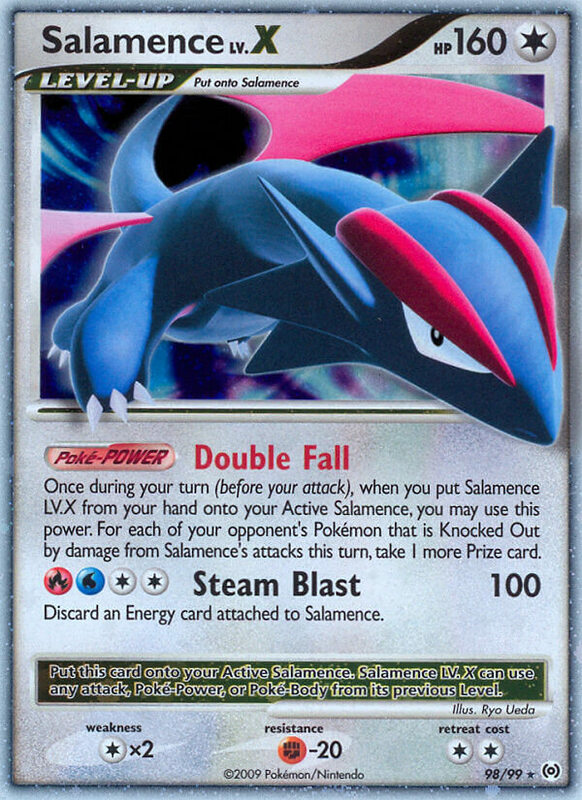 Salamence LV.X can use any attack, Poké-Power, or Poké-Body from its previous level. Once during your turn (before your attack), you may flip a coin. 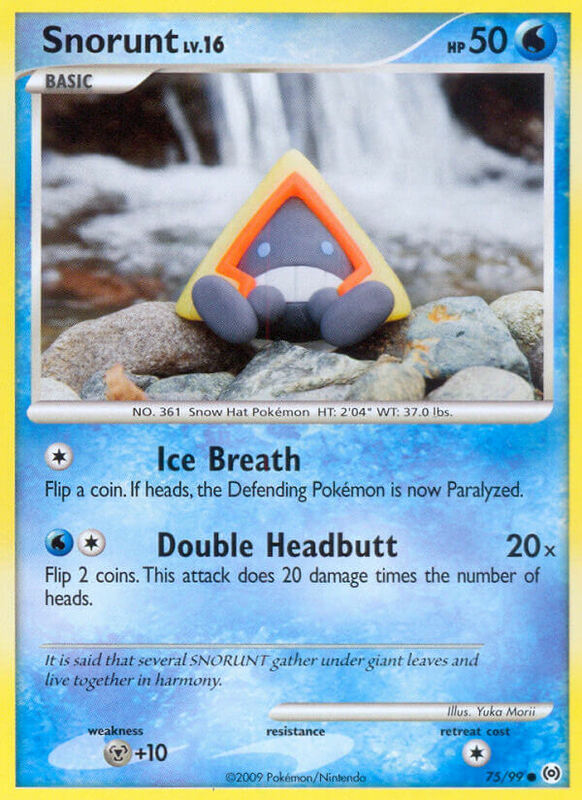 If heads, remove 4 damage counters from 1 of your Pokémon. 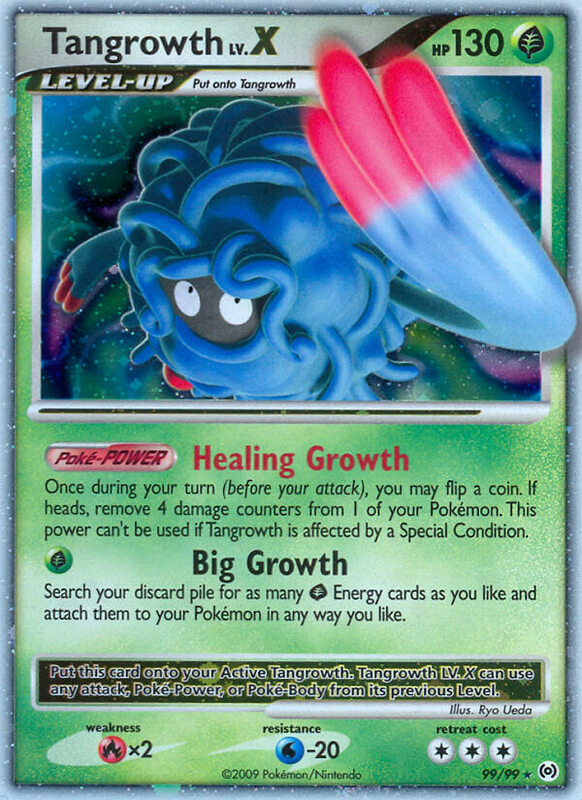 This power can’t be used if Tangrowth is affected by a Special Condition. 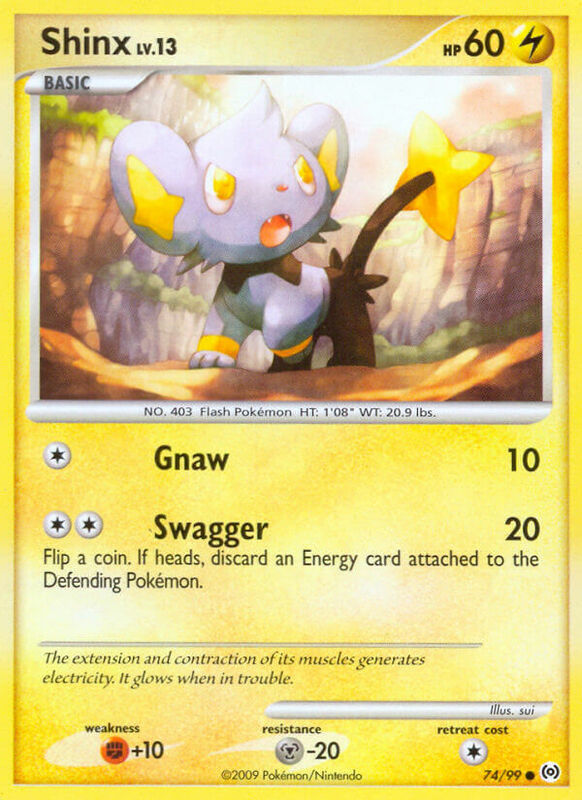 Search your discard pile for as many [G] Energy cards as you like and attach them to your Pokémon in any way you like. 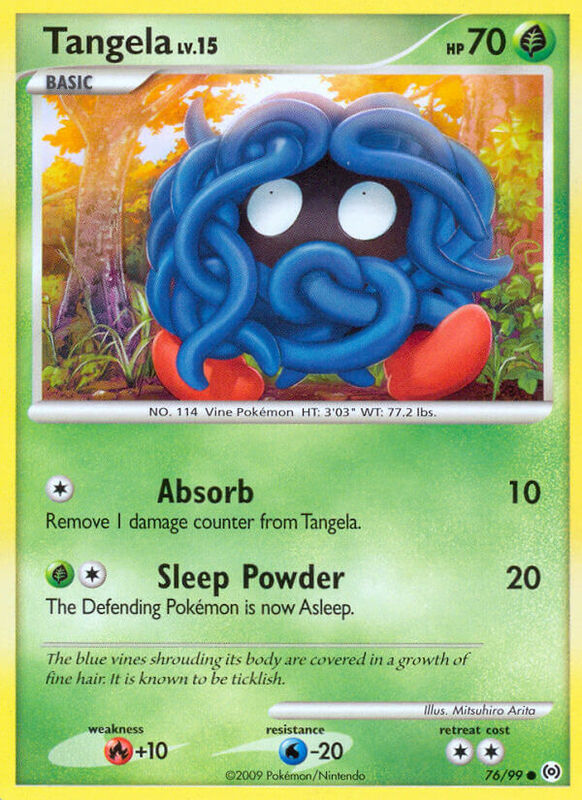 Put this card onto your Active Tangrowth. 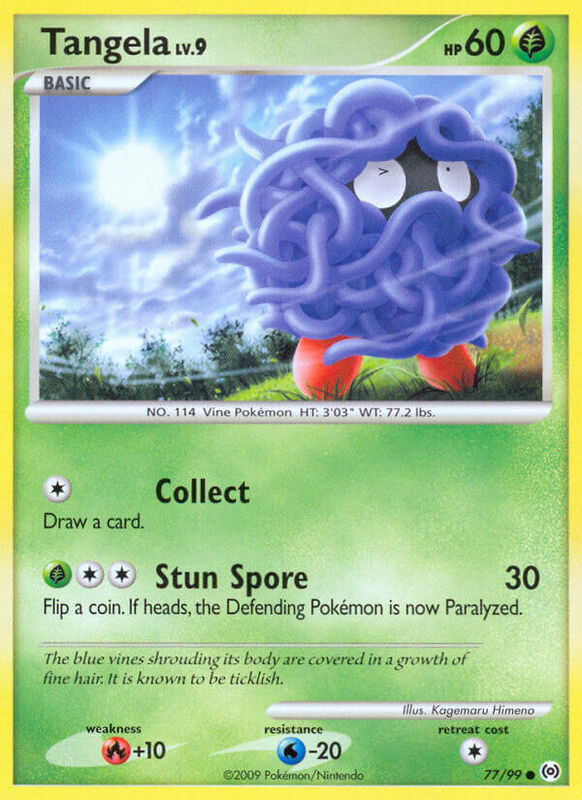 Tangrowth LV.X can use any attack, Poké-Power, or Poké-Body from its previous level. 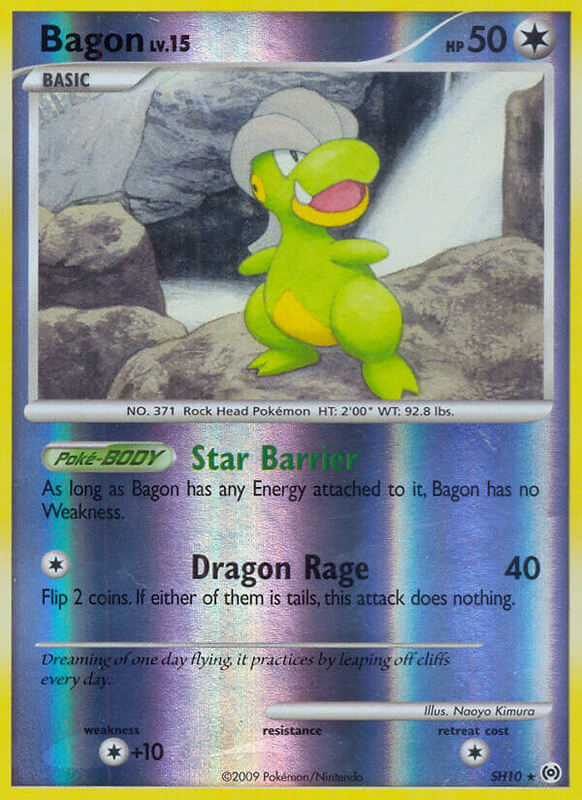 As long as Bagon has any Energy attached to it, Bagon has no Weakness. Flip 2 coins. If either of them is tails, this attack does nothing. 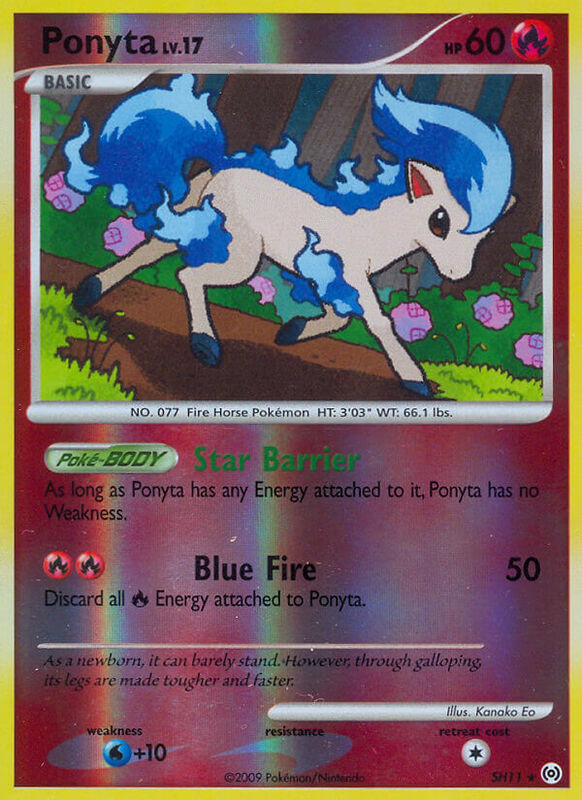 As long as Ponyta has any Energy attached to it, Ponyta has no Weakness. 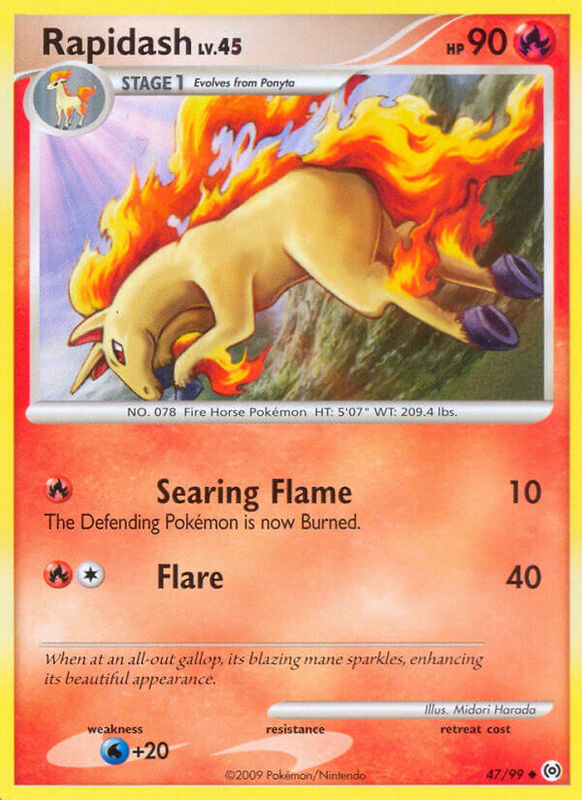 Discard all [R] Energy attached to Ponyta. 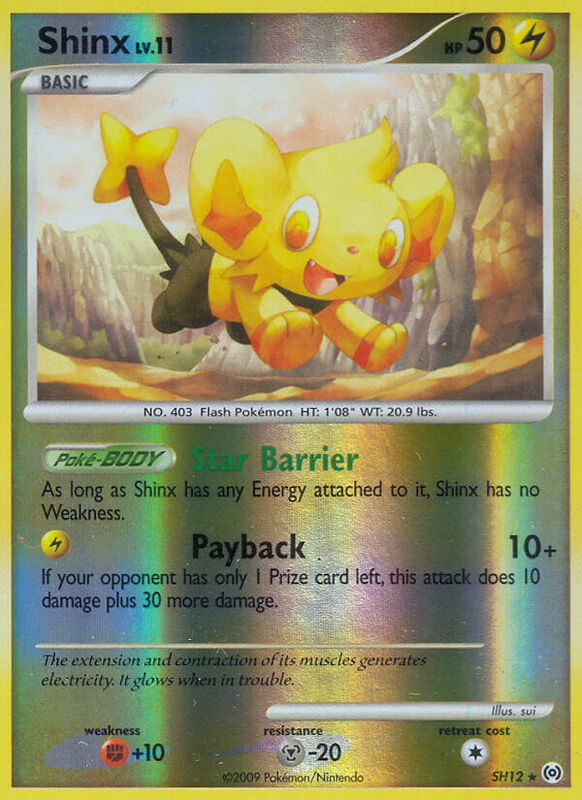 As long as Shinx has any Energy attached to it, Shinx has no Weakness. If your opponent has only 1 Prize card left, this attack does 10 damage plus 30 more damage. Remove 3 damage counters from each of your Benched Pokémon. It is said to have emerged from an egg in a place where there was nothing, then shaped the world. Flip a coin. 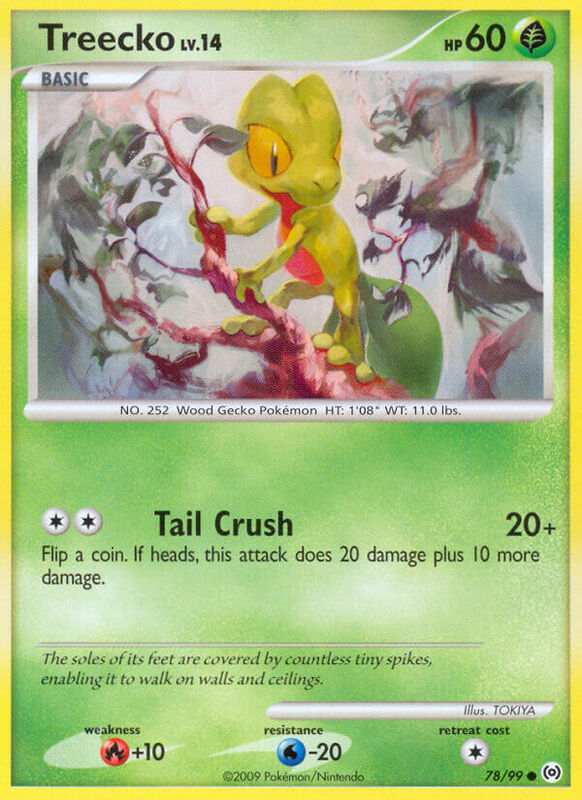 If tails, discard 2 Energy attached to Arceus. 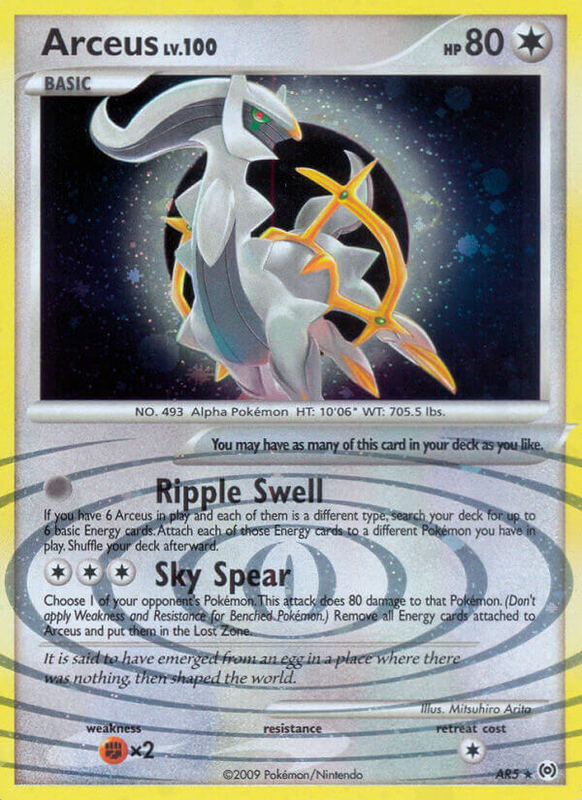 If you have 6 Arceus in play and each of them is a different type, search your deck for up to 6 basic Energy cards. 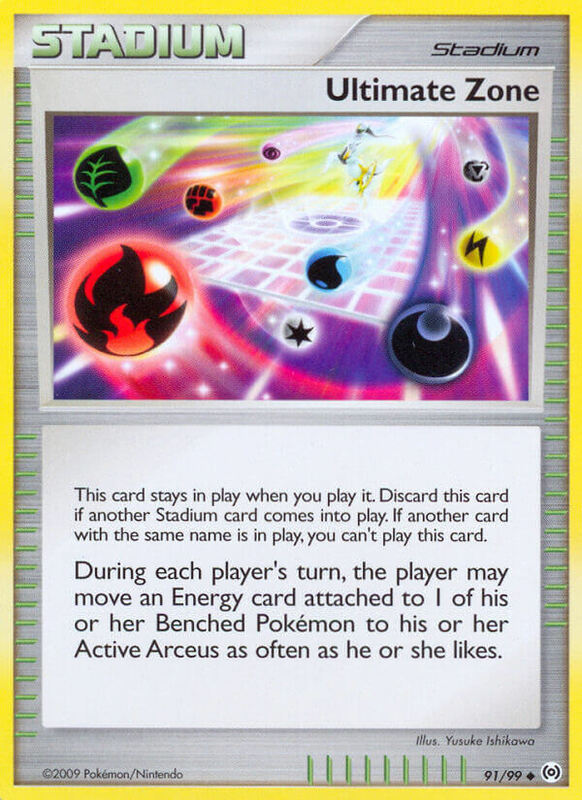 Attach each of those Energy cards to a different Pokémon you have in play. Shuffle your deck afterward. Choose 1 of your opponent’s Pokémon. This attack does 80 damage to that Pokémon. (Don’t apply Weakness and Resistance for Benched Pokémon). 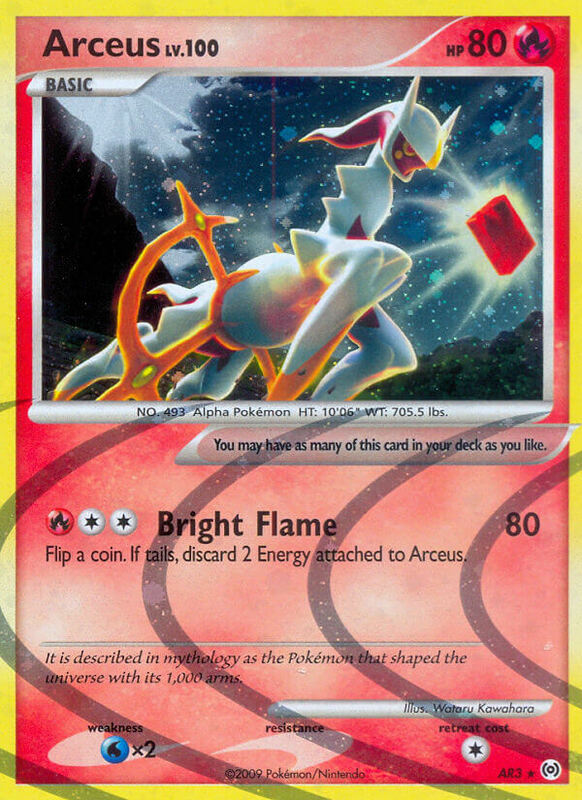 Remove all Energy cards attached to Arceus and put them in the Lost Zone. 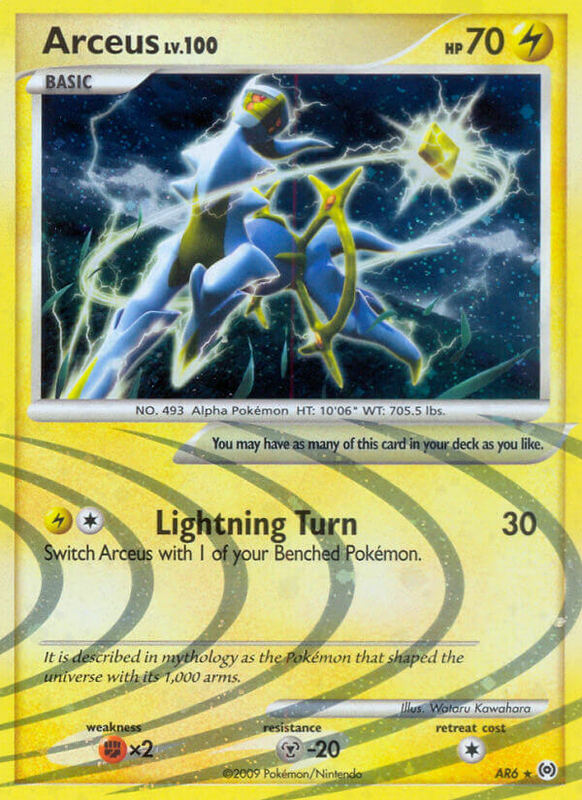 Switch Arceus with 1 of your Benched Pokémon. 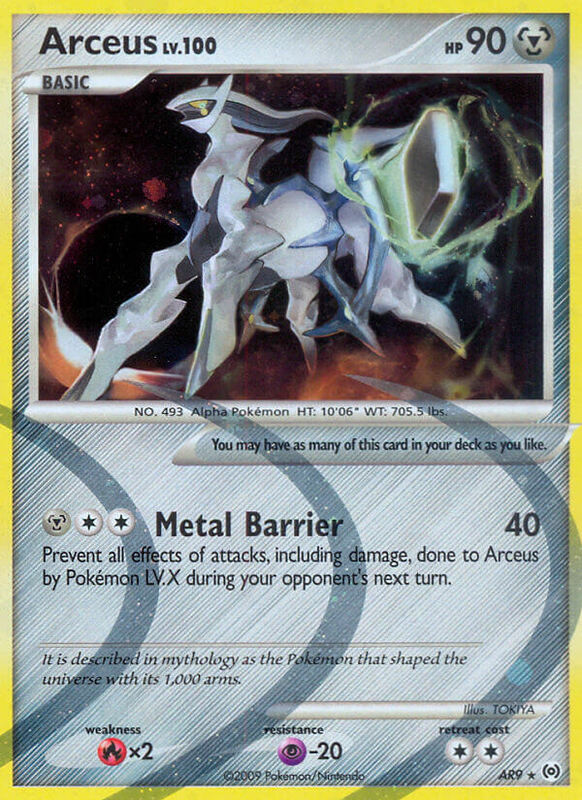 Prevent all effects of attacks, including damage, done to Arceus by Pokémon LV.X during your opponent’s next turn.